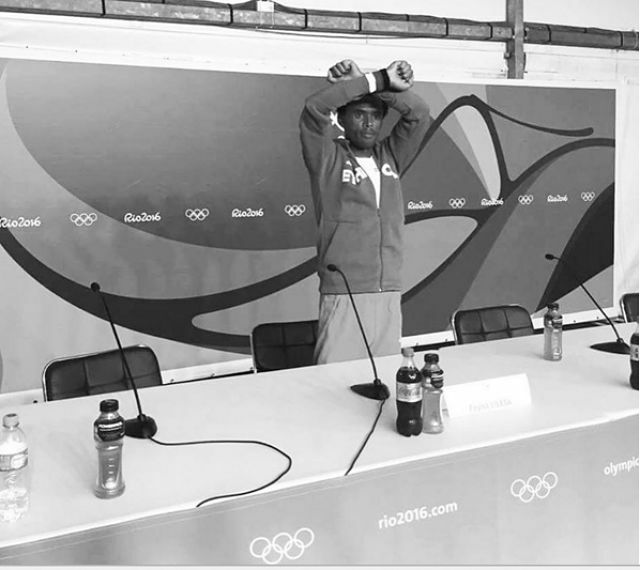 New York (TADIAS) — One of the key moments that occurred during the nation-wide civil unrest in Ethiopia in the last few years, prior to current reforms, included Olympic marathoner and silver medalist Feyisa Lilesa’s symbolic protest at the 2016 Rio Olympics in Brazil. The photo of Feyisa crossing the finish line with his hands crossed over his head — already a popular act of protest among the youth in Ethiopia — reverberated across the world. He then repeated the protest sign at a follow-up press conference and refused to return home, fearful of government reprisal. 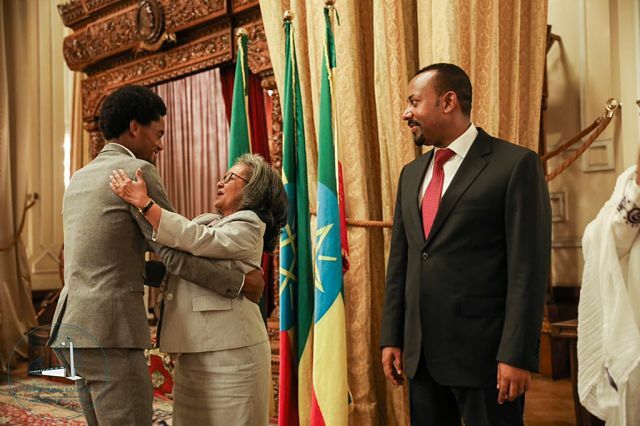 As Feyisa’s daring protest brought immediate global attention to the festering crisis in his native country, the athlete sought political asylum in the United States. Feyisa returned to Ethiopia this past October following the new Prime Minsiter Abiy Ahmed’s call for exiled Ethiopians to come home. 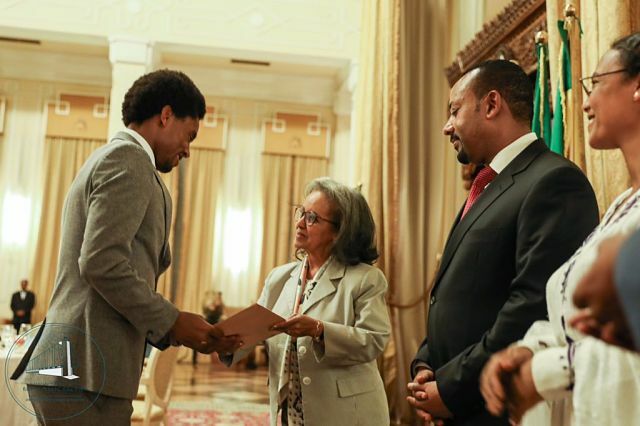 On Tuesday Feyisa received a well-deserved heroes honor in Ethiopia while meeting with PM Abiy and President Sahle-Work Zewde, and was also awarded $17,000 USD for garnering Ethiopia a silver medal at the Olympics. 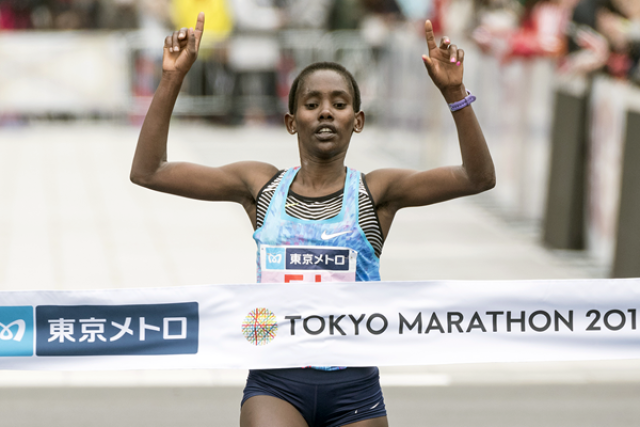 New York (TADIAS) — Ethiopian women won the top three spots at the 2019 Tokyo Marathon on Sunday. 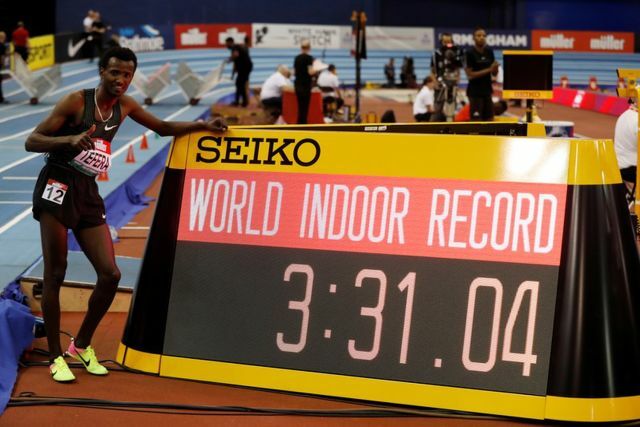 Ethiopia’s Samuel Tefera broke the long-standing world indoor 1,500 metres record when he clocked three minutes, 31.04 seconds at the IAAF World Indoor Tour meeting in Birmingham, England on Saturday. Morocco’s Hicham El Guerrouj set the previous record of 3:31.18 in 1997. Ethiopia’s Samuel Tefera tore up the script for the Muller Indoor Grand Prix Birmingham, upstaging compatriot Yomif Kejelcha to break the long-standing world indoor 1500m record* at the IAAF World Indoor Tour meeting on Saturday (16). Kejelcha, who last week came within 0.01 of the world indoor mile record at the Millrose Games, had announced his intentions to break the 1500m mark ahead of his race in Birmingham. 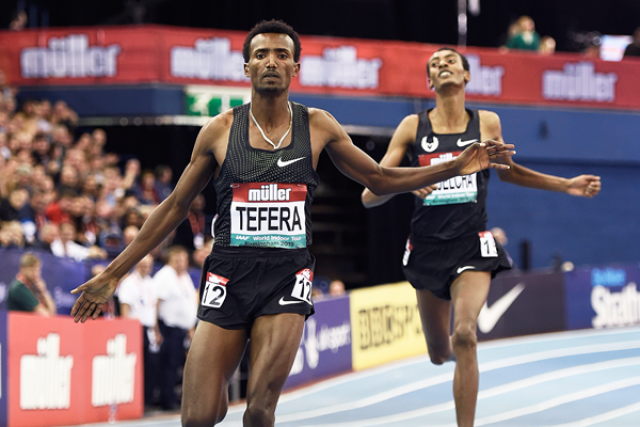 But Tefera, the world indoor champion at the distance, had a plan of his own. The pacemakers hit their required target times with Bram Som taking the field through 400m in 55.69 and Jordan Williamsz leading them through 1000m in 2:21.27. 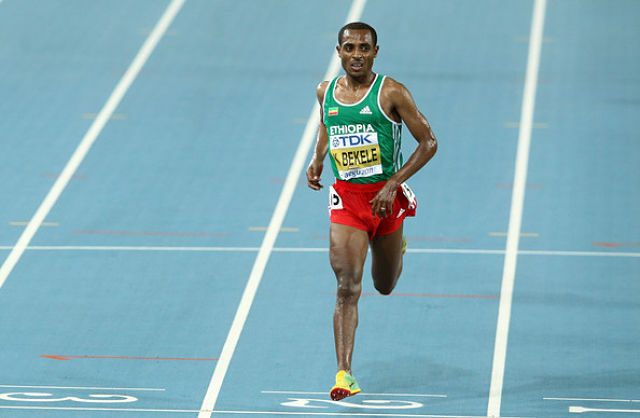 With the pacemakers having done their job, Kejelcha reached 1200m in 2:49.28 and was still on course to challenge the record, but Tefera was tucked close behind and looked ominously comfortable with the pace. Australia’s Stewart McSweyn was a few strides adrift in third place while Kenyan duo Bethwel Birgen and Vincent Kibet were further behind. The clock ticked through 3:03 as the bell sounded for the final lap and Tefera made his move, kicking past Kejelcha to take the lead and leaving his compatriot unable to respond. Tefera charged towards the line and stopped the clock at 3:31.04, taking 0.14 off the previous record set by Hicham El Guerrouj in 1997. Kejelcha finished second in an outright personal best of 3:31.58 while McSweyn held on to third place with an Oceanian indoor record of 3:35.10. 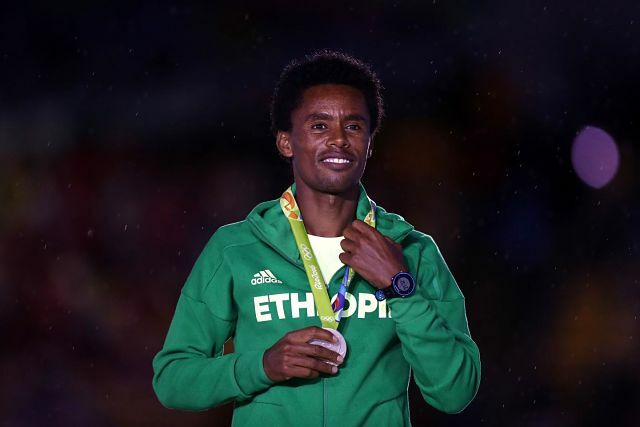 ADDIS ABABA, Ethiopia (AP) — The Ethiopian marathon runner who made global headlines with an anti-government gesture at the Rio Olympics finish line returned from exile on Sunday after sports officials assured him he will not face prosecution. Feyisa later said he feared he would be imprisoned or killed if he returned home. 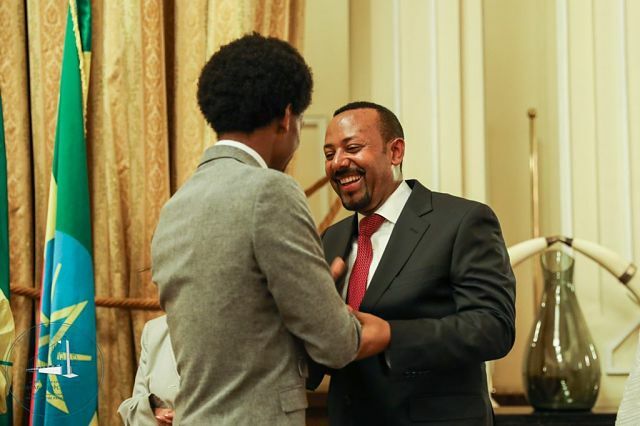 But he became a symbol of resistance for many youth until the pressure on the government led to a change of power, with 42-year-old Prime Minister Abiy Ahmed taking office in April. Abiy is the country’s first leader from the Oromo ethnic group since the ruling coalition came to power 27 years ago. 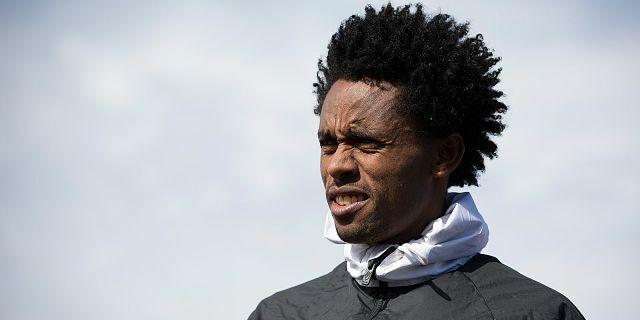 After winning the silver medal in the men’s marathon at the 2016 Olympic Games in Rio de Janeiro, Brazil, Feyisa Lilesa spent two years in self-imposed exile in the United States. Now, he’s returning home. 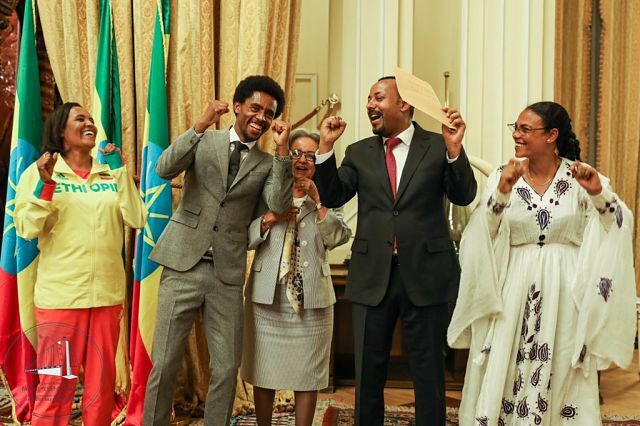 Feyisa will return to Ethiopia in the coming weeks with his wife and children after two athletics groups notified him that he would receive a hero’s welcome upon arriving. 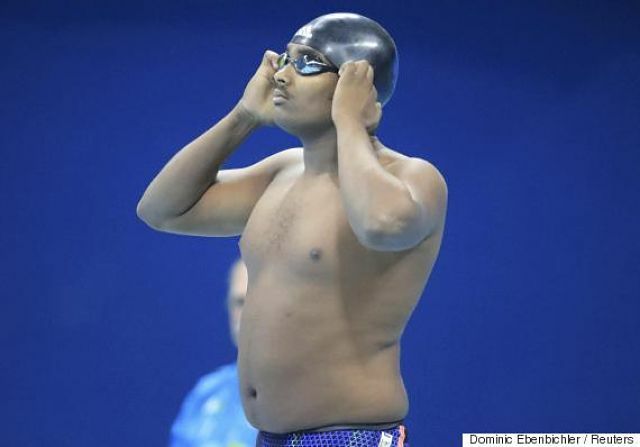 Ashebir Woldegiorgis, the president of the Ethiopian Olympic Committee, told VOA Amharic that the call for Feyisa to return is meant to better the country. “He can teach his exemplary ways to other athletes and teach strength to our youngsters. 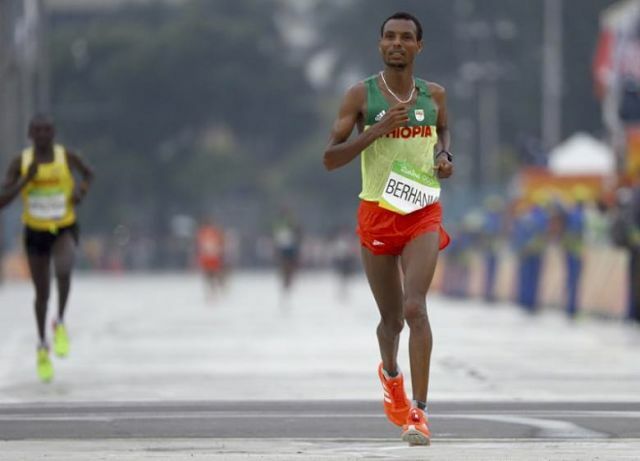 That’s the main call, so he can come back to participate in the sport he loves and pass it on by running and by advising to elevate Ethiopia’s sport,” Ashebir said. Feyisa made international headlines when he raised his crossed wrists above his head at the finish line, and again on the podium, at the 2016 summer games. The Girls Gotta Run Foundation started out with an effort to get running shoes to girls in Ethiopia. Now, more than a decade later, the Washington, D.C.-based nonprofit is working with 100 girls and 40 mothers in the African country. And the Girls Gotta Run Foundation provides more than just shoes. 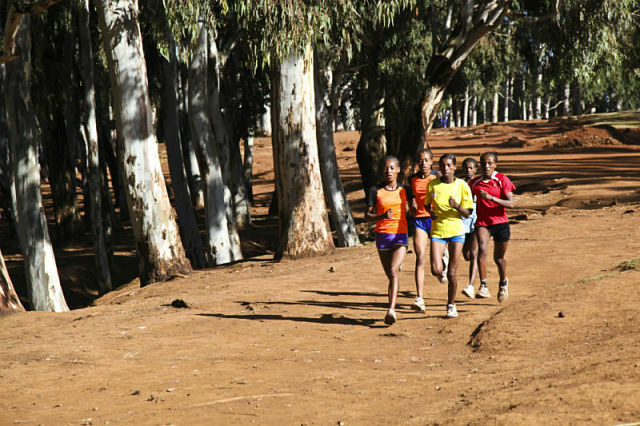 Three-year scholarship programs in Sodo and Bekoji, Ethiopia, allow girls to stay in school while also running, receiving coaching and running gear, and learning life skills, according to the nonprofit’s website. 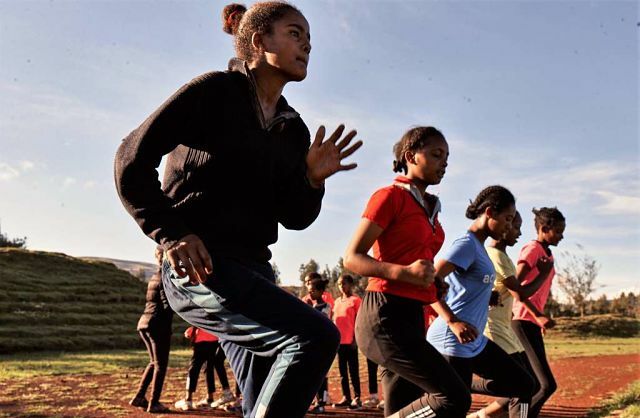 In a place where child marriage is not uncommon, running provides an opportunity for Ethiopian girls to have more control over their futures — even if they don’t become professional runners. Education is key in the scholarship programs. The Girls Gotta Run Foundation has worked with 210 people in total, she wrote. Founder Pat Ortman, a retired women’s studies professor at Mount Vernon College, said the organization has grown much more than she imagined. In late 2005, Ortman read a Washington Post article titled “Facing Servitude, Ethiopian Girls Run for a Better Life.” She said she was impressed by the determination of the Ethiopian girls despite their tough circumstances. One runner featured in the story spoke of how she had to either run barefoot or in her brothers’ shoes because she didn’t have her own. “They were just so optimistic,” she said. 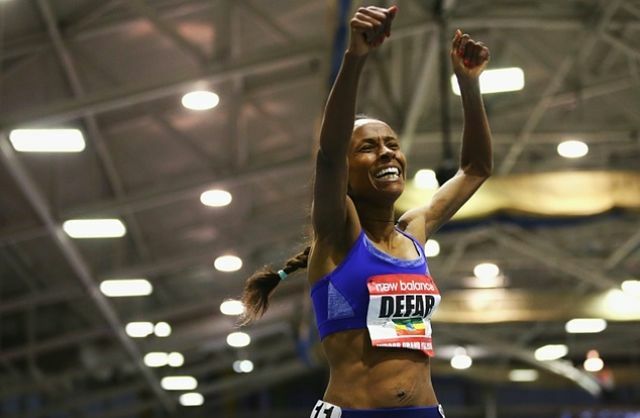 The peerless Ethiopian Dibaba, who had lifted the 3,000 metres title on Thursday, had her work cut out to achieve the double in the metric mile but produced another solo tour de force. Stretching her pursuers to breaking point by powering for home with almost a kilometre left, the 27-year-old kept Britain’s silver medallist Laura Muir and Dutch defending champion Sifan Hassan at bay to win convincingly in four minutes 05.27 seconds. It made her only the fourth athlete ever to win five individual gold medals in the championships. Dibaba helped Ethiopia to the second position on the medals table with a total of 5 medlas, with Team USA leading the medal standings with 18. 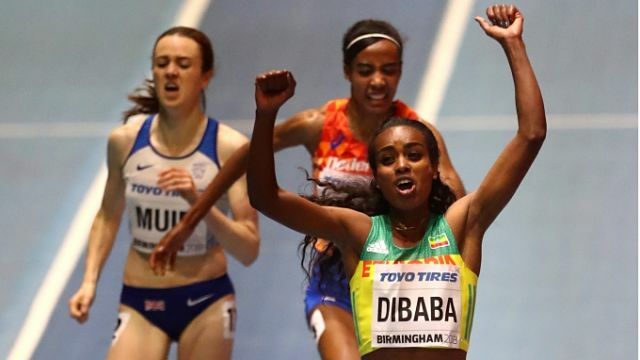 BIRMINGHAM, ENGLAND (01-Mar) — Genzebe Dibaba of Ethiopia became the third athlete to win the women’s 3000m title at the IAAF World Indoor Championships on at least three occasions in an exciting climax to the first day which had a sparse but enthusiastic home crowd cheering the narrow but growing possibility of a home winner in Laura Muir on the last lap. Dibaba crossed the finish-line in 8:45.05, a finishing time made respectable courtesy of a scintillating final kilometer of 2:37.43. “I’m very happy to be indoor champion for the third time. This is a great competition and the race was fantastic. This day is for me and my country,” said Dibaba, who is due to contest the 1500m heats tomorrow evening. It’s fair to say that Genzebe Dibaba likes racing indoors. 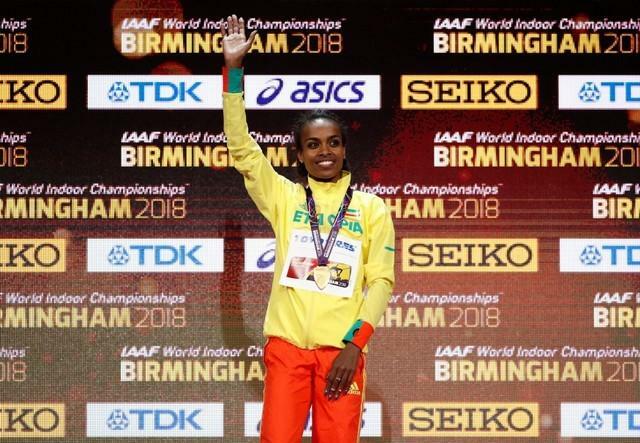 The Ethiopian’s first global title was secured at the IAAF World Indoor Championships over 1500m in 2012 and she picked up her third consecutive gold over 3000m following a superb performance in Birmingham. Content to sit at the back of the field for the first kilometre, the 27-year-old surged with just under 2000m remaining and was never seriously challenged, galloping to victory in 8:45.05. Tomorrow she’s back in the first round of the 1500m. 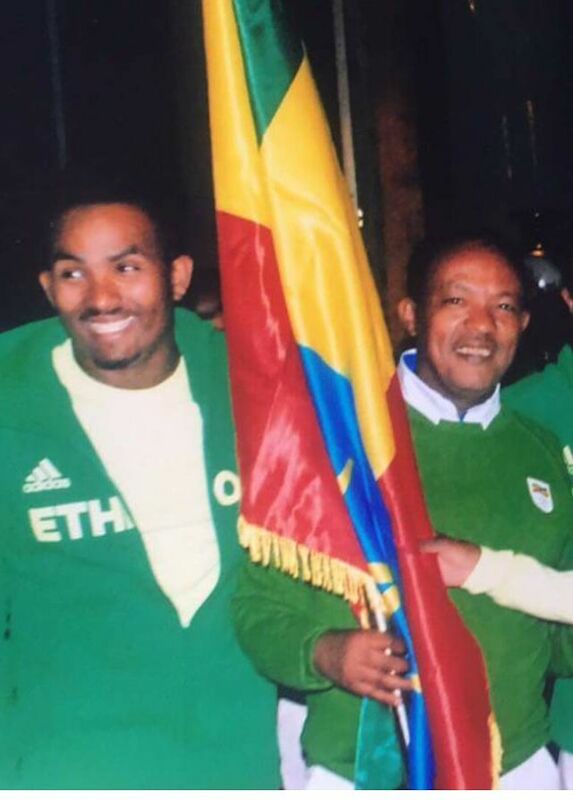 Demssew Tsega Abebe was a famous marathon runner in Ethiopia and was expected to be on his country’s Olympic team. But his career was cut short when he was tortured for peacefully protesting his government’s policies. His heels and feet were so severely lashed he could not run for more than a year. He fled to the Washington area in 2016, and he has been trying to bring his wife and two children to the United States ever since, in part to get medical care for his 5-year-old son, Dagmawi, who cannot speak. Until today, Abebe had never met his 2-year-old daughter, Soliyana, as his wife was pregnant with her when he fled. 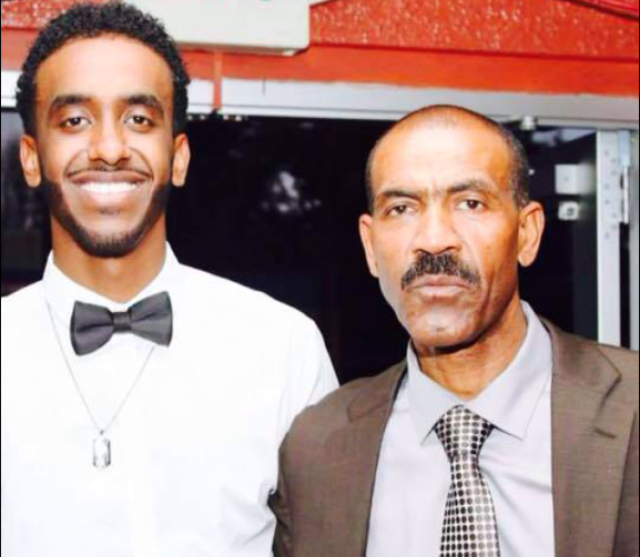 Last week, Abebe learned that his family had won a humanitarian immigration petition to join him. Fittingly, they arrived early Valentine’s Day morning at Dulles International Airport. He held his daughter for the first time. He said Valentine’s Day isn’t much of a holiday in Ethiopia, but he said he is proud to be reuniting with his family on a day that celebrates love, in a nation where he is free to express himself. “I am so happy, I thank God,” said Abebe, 29, who lives in Silver Spring. 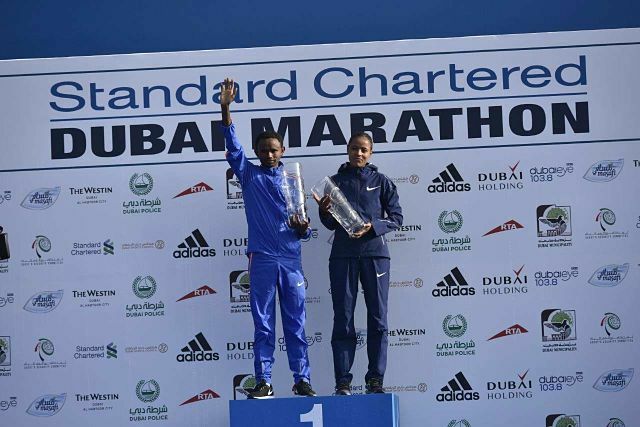 Mosinet Geremew of Ethiopia broke the course record to emerge as the new champion of the Standard Chartered Dubai Marathon 2018 with a time of 2:04:00. The previous record was held by 2017 Dubai Marathon winner Tamirat Tola Adere from Ethiopia who finished in 2:04:11. 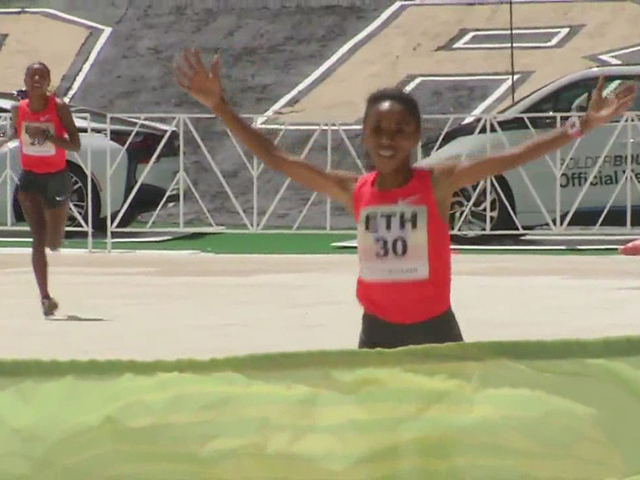 Roza Dereje of Ethiopia too broke the course record in the women race with a timing of 2:19:17. Dereje broke the course record held by 2012 Dubai Marathon winner Aselefech Mergia, also from Ethiopia with a timing of 2:19:31. It was a clean sweep again by the Ethiopian runners with all the first ten finishes in the men’s race being swept away by the Ethiopians. 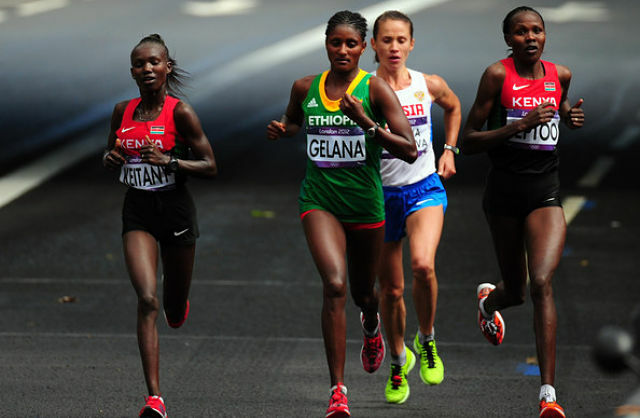 In the women’s race the first seven finishes were by the Ethiopian women. 3. Yebrg Melese Arage 2:19:36. Ethiopia’s triple Olympic track champion Kenenisa Bekele will race the London Marathon in April and line up alongside Briton Mo Farah and Kenya’s Eliud Kipchoge for what promises to be a mouth-watering contest. Bekele, 35, regarded by many as the greatest distance runner of all time and holder of the 5,000m and 10,000m world records, finished second in London last year and was third in 2016. A pre-race favorite last year, Bekele had hoped to break Dennis Kimetto’s men’s world record of 2:02.57 but had trouble with blisters on his feet and crossed the finish line behind Kenya’s Daniel Wanjiru. 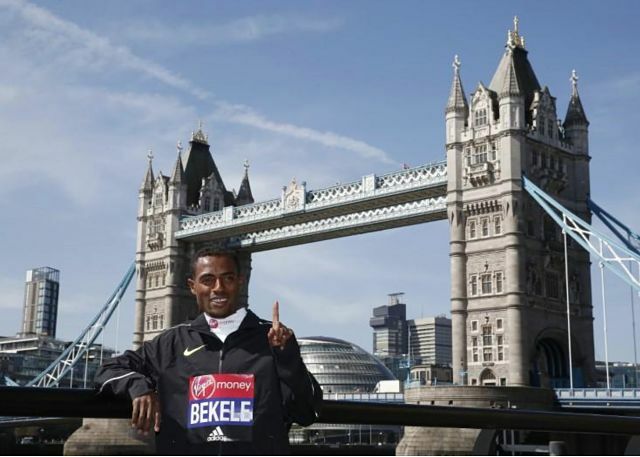 “I am thrilled to be returning to London for the third year in a row and would love to go one better than last year and win the race,” Bekele said in a statement. The trio of Bekele, Farah and Kipchoge have a combined total of eight Olympic gold medals and 12 world championship gold medals between them. The London Marathon will be held on April 22. 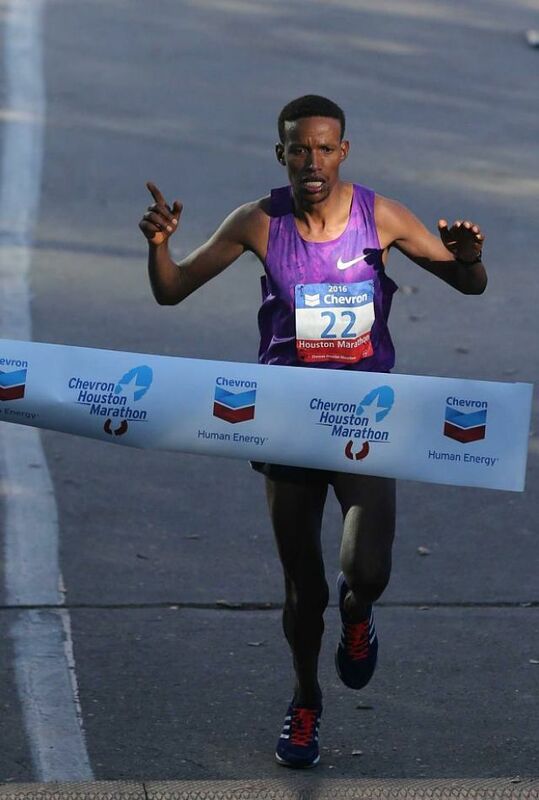 HOUSTON — Bazu Worku held up three fingers as he headed down the final stretch of the Houston Marathon. 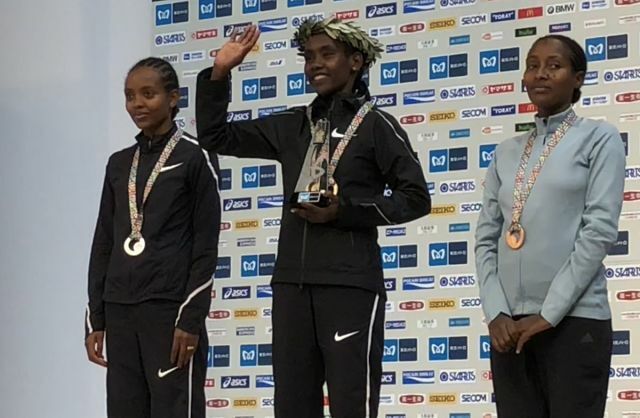 Biruktayit Degefa won the women’s race and two-time Olympian Molly Huddle broke the record for the fastest half-marathon by an American woman. “It was exhilarating,” Worku said. 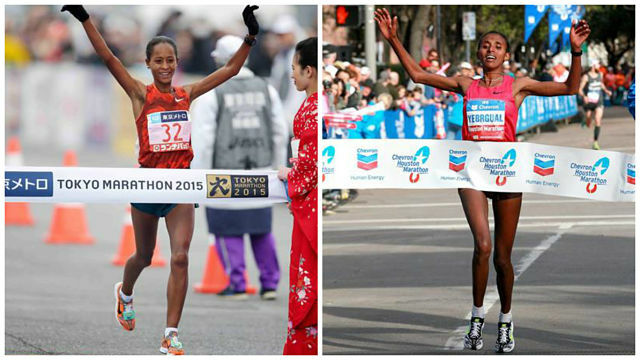 Degefa captured her second women’s title at the Houston Marathon, finishing with a time of 2:24:51. She has competed in this race five years in a row. Who is Vying for Control of the Ethiopia Football Federation? Addis Ababa — On 13 January five men vie to become the next president of the Ethiopian Football Federation (EFF). 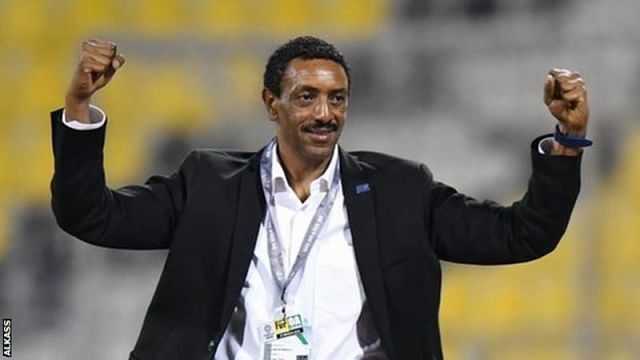 Despite its place as one of the founding members of the Confederation of African Football (Caf) and former Africa Cup of Nations winners Ethiopian football has struggled in recent years. 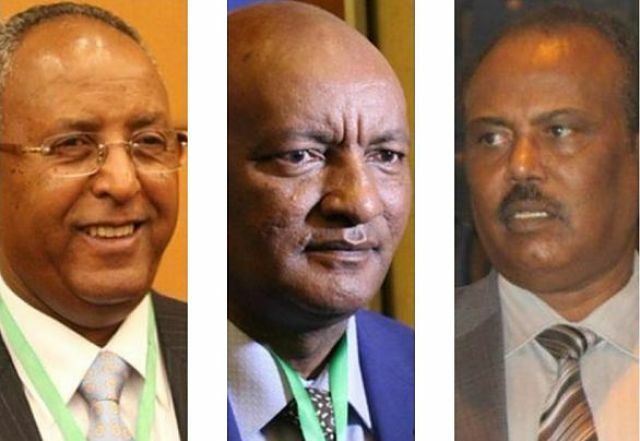 The five men hoping to change that are incumbent Juneidin Basha, former president Dr Ashebir Woldegiorgis, Teka Assefaw, Dagim Melashen and Esayas Jira. The elections, which will also see a new executive voted in, had been due to take place on 10 November but were postponed in order for the candidates to be properly vetted. Two former national team coaches, Sewnet Beshaw and Asrat Haile, are bidding for places on the executive committee. The IAAF is deeply saddened to hear of the untimely death on Tuesday (28) of Ethiopian distance runner Zenash Gezmu. The 27-year-old had been based in France for most of her international racing career and represented the Neuilly sur Marne athletics club on the outskirts of Paris. A three-time winner of the Marathon de Senart, Gezmu set her lifetime best of 2:32:48 when finishing sixth at last year’s Amsterdam Marathon. In addition to her triumphs in Senart, Gezmu had also won numerous 10km, half marathon and cross-country races in France in recent years. ADDIS ABABA, Ethiopia — Organizers say two competitors have died in the 10-kilometer (6.2-mile) Great Ethiopian Run road race. Organizers didn’t identify the two runners or give causes of death. Police said medical experts suspect heart problems could be the cause of both deaths. 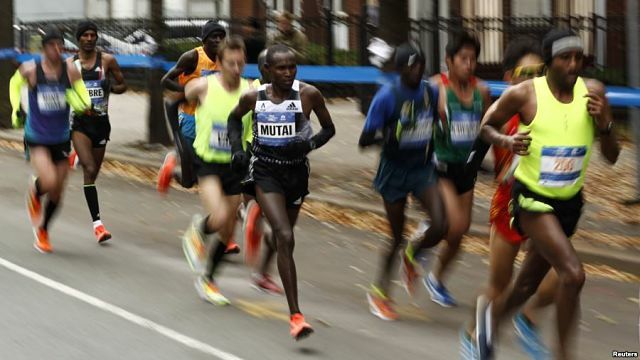 Around 45,000 people competed in Sunday’s race, including Olympic 5,000 meter champion Vivian Cheruiyot of Kenya and former world half-marathon champion Lornah Kiplagat of the Netherlands. The Great Ethiopian Run was started by the country’s distance-running great Haile Gebrselassie in 2001 and is the largest road race in Africa. New York (TADIAS) — For a second year in a row Ethiopia’s Olympic champion and world 10,000m titleholder Almaz Ayana has been named a finalist for the World Athlete of the Year award. She was the winner of last year’s Female World Athlete of the Year prize. 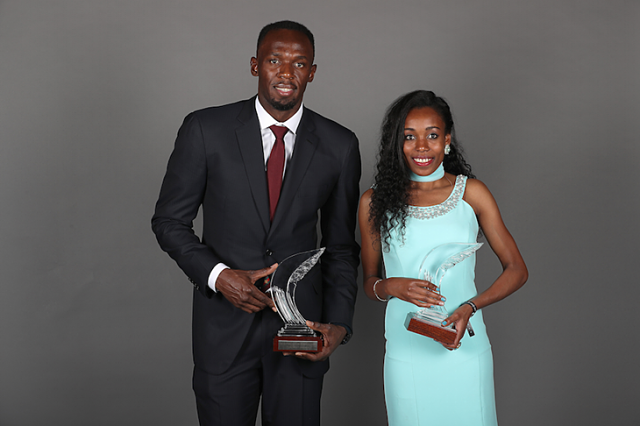 The International Association of Athletics Federations (IAAF) said on Monday that the male and female World Athletes of the Year for 2017 will be announced live on stage at the IAAF Athletics Awards 2017 in Monaco on Friday 24 November. The 10 nominees for the 2017 Female Athlete of the Year have been announced and the voting process is in full swing. We look at some of the words these superwomen used to describe their incredible accomplishments. After winning the 10,000m world title in a world-leading 30:16.32. She won silver over 5000m a few days later. New York (TADIAS) — Olympian and World 10,000m champion Almaz Ayana has been nominated for the 2017 World Athlete of the Year award. The Ethiopian long distance runner, who was also the winner of last year’s Female World Athlete of the Year prize, won the 10,000 metre race at this year’s World Championships held in London this past summer. CHICAGO – Ethiopian Tirunesh Dibaba, who during her illustrious career has won 12 global titles including three Olympic golds, added a new accomplishment to her CV today — she won her first marathon as she captured the 2017 Bank of America Chicago Marathon in 2:18:31 – the second-fastest time ever recorded in Chicago. Kenya’s Brigid Kosgei was second in a massive new pb of 2:20:22 (previous pb of 2:24:45). 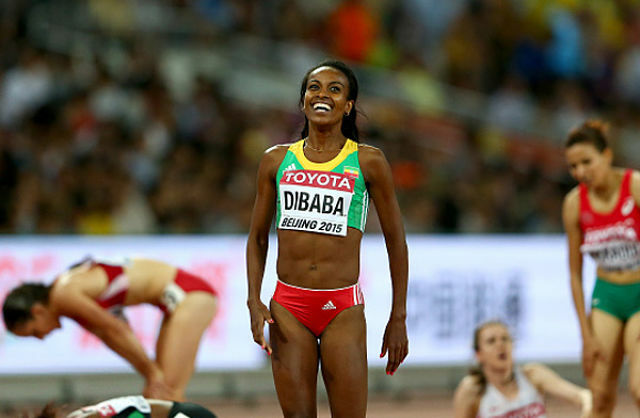 Dibaba’s victory was much-deserved as well as she hammered from the gun. She ran her first 5k in 16:09 (that’s 2:16:09 pace) but five women were still with her at halfway. Shortly after that it became a two-person battle between Dibaba and Kosgei as Kosgei did her best to stay with Dibaba, who often was swerving from side to side to prevent Kosgei from drafting off of her. 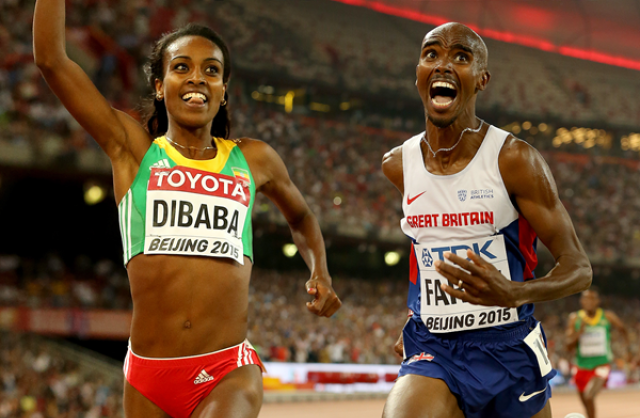 A 5:15 20th mile gave Dibaba a sizeable lead, which only grew to the finish. With Dibaba’s victory assured, the only drama was how well everyone else would hold up until the finish as all of the five women in the lead pack at halfway ran a positive split. Ethiopian climber Tsgabu Grmay has joined Trek for 2018, the American team announced on Monday. The 26-year-old, the African time-trial champion two years ago, joins from Bahrain. He has ridden five Grand Tours including the last two Tours de France. Trek-Segafredo announced the addition of two riders to their 2018 roster on Monday, completing their line-up for the coming season. 26-year-old Ethiopian Tsgabu Grmay and 20-year-old Italian trainee Nicola Conci will join the American WorldTour team next year. “I’m very happy about this move. Trek-Segafredo really stood out for me because they offer a very professional guidance for their athletes. I am confident that within this team I can continue my development as a rider in the best circumstances,” Grmay said in a team press release. Ethiopian Almaz Ayana destroyed the field to win the 10,000 metres at the World Championships on Saturday, finishing around 300 metres clear of her rivals in her first race of an injury-plagued season. The Olympic champion began pulling away from the field after 10 laps, sweeping past back markers who were made to look sluggish in comparison. She finished in 30:16.32 seconds, well outside the world record she set when she won in Rio last year but still enough to win by an astonishing 46.37 seconds, by far the biggest margin in championship history. Ayana’s compatriot Tirunesh Dibaba, the former world and Olympic champion, added to her impressive collection of medals when he took the silver with Kenya’s Agnes Tirop in third. “I am very happy to win this title, much more than when I won the Olympic gold because I have been sick this year and didn’t expect it. 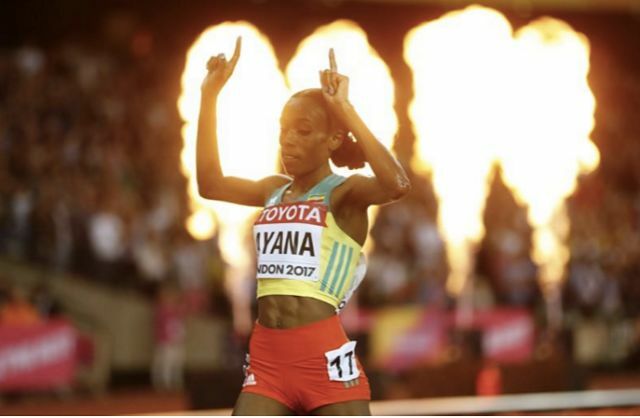 In fact, this was my first race of 2017,” Ayana told reporters. A repeat of her world record-breaking performance in Rio was never on the cards after a slow, tactical start to the race in which the field crawled around the first lap in 81 seconds. But the last two thirds of the race was reminiscent of Ayana’s extraordinary run last year where she also blew away the field. He runs on a slender dirt road the color of rust. His legs churn with an easy rhythm as he passes clumps of snow, then thorn trees and sage swaying in the winter wind. Out here on the Arizona desert, he is easy prey. It’s January, and there’s a stillness about Feyisa Lilesa, even in the 12th mile of a workout. He is with another runner because it’s riskier to train alone. With every compact stride, Lilesa lands on the balls of his feet and then flicks his size 9 Nikes, creating a soft shushing sound. The stillness surrounding him belies the feelings in his heart. Until late last summer, the 27-year-old called Ethiopia, not Arizona, home. 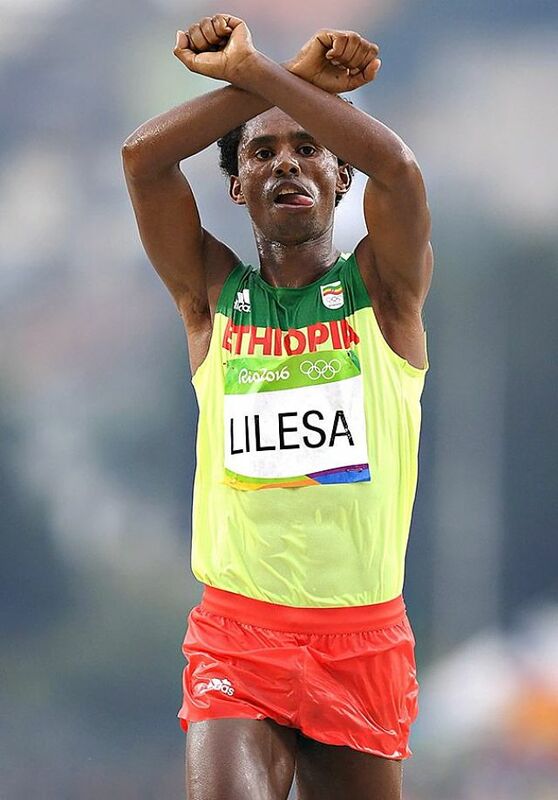 But since the Rio Olympics, when he won a silver medal in the marathon and engaged in a dramatic finish-line protest against the Ethiopian government, Lilesa has been in exile and does not dare go home again. 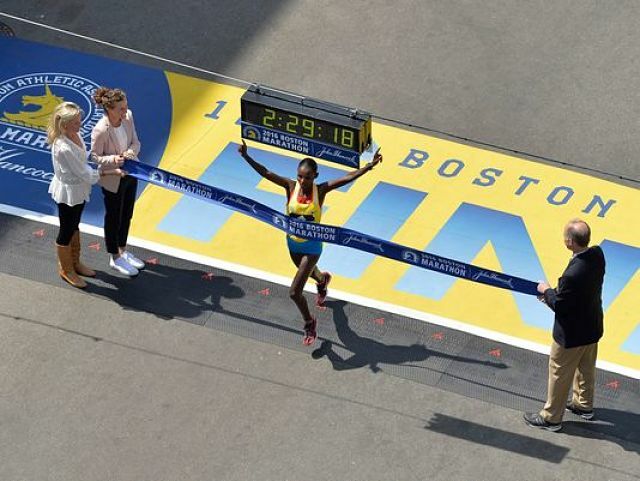 BOSTON – Buzunesh Deba will leave the Boston Marathon with one champion’s medal this week. She would like to make it two. The 29-year-old Ethiopian inherited the 2014 title this December when Kenya’s Rita Jeptoo was stripped of her victory for testing positive for performance-enhancing drugs. Jeptoo joins Rosie Ruiz, who was caught cutting the course in 1980, as the only people to be disqualified from the Boston Marathon after breaking the tape on Boylston Street. When Ruiz took a shortcut to the finish line, she deprived Jacqueline Gareau of the thrill of breaking the tape , being crowned with the traditional olive wreath and hearing the Canadian national anthem waft over Copley Square. Race officials, who were immediately skeptical of the unknown and unseen Ruiz, made it up to Gareau with a substitute victory ceremony and even had her cross the finish line again – this time in street clothes. But Gareau’s victory was in the race’s amateur era, so there was no cash to recover. Jeptoo, whose 2006 and 2013 victories remain unchallenged, claimed $150,000 for the victory and an additional $25,000 for setting a course record. 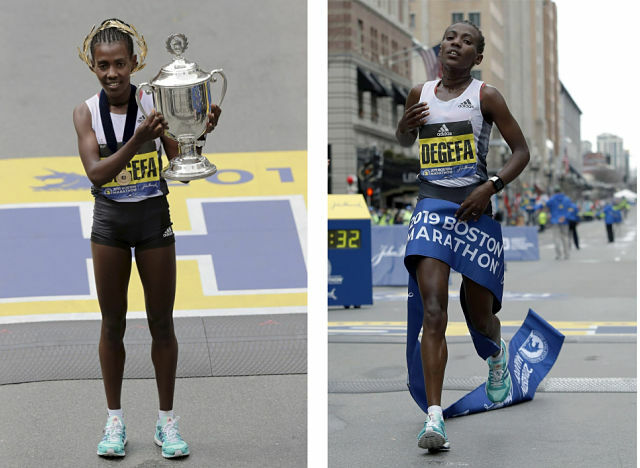 Both legally belong to Deba, whose time of 2 hours, 19 minutes, 59 seconds remains the fastest in Boston Marathon history, but the Boston Athletic Association would have to claw it back from Jeptoo. “We are trying,” CEO Tom Grilk said. In the year after the finish line explosions that killed three people and wounded hundreds more, Jeptoo herself was already an afterthought, coming in just minutes before Meb Keflezighi claimed the first American victory in the men’s race since 1983 . 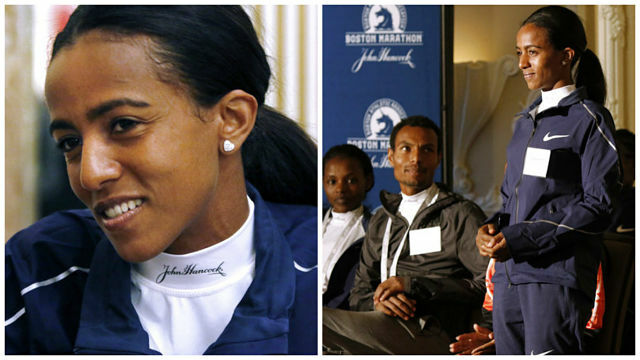 As “The Star-Spangled Banner” played over Boylston Street, Jeptoo’s third win – even in a course-record time – drew less attention than normal. But for Deba, it was costly. All the after-the-fact ceremonies, medals and even the prize money – if she ever gets it – wouldn’t make up for the opportunities lost when she wasn’t able to capitalize on being a returning champion. Deba’s husband and coach, Worku Beyi, said they are talking to B.A.A. officials about the prize money, “but it is not 100 percent.” They are hoping Jeptoo will return the money. “She knows herself she is not champion,” Beyi said. Deba has a chance to steal back the spotlight on Monday, when she joins a field of more than 30,000 in Hopkinton for the 121st edition of the race. Among them are defending champion Atsede Baysa of Ethiopia; Kenya’s Gladys Cherono, who has the fastest time in the field; and two-time Olympian Desi Linden, who is trying to become the first American woman to win in Boston since 1985. BOSTON — Ethiopian runner Lemi Berhanu Hayle will defend his Boston Marathon title in a wide open race on Monday against a men’s field that includes the first American champion in three decades and no clear favorite. Berhanu Hayle won last year’s race in two hours 12 minutes 44 seconds after pulling away from twice champion and countryman Lelisa Desisa, who is not competing this year. The last men’s repeat winner was five-time champion Robert Kipkoech Cheruiyot of Kenya, who completed a triple in 2008. 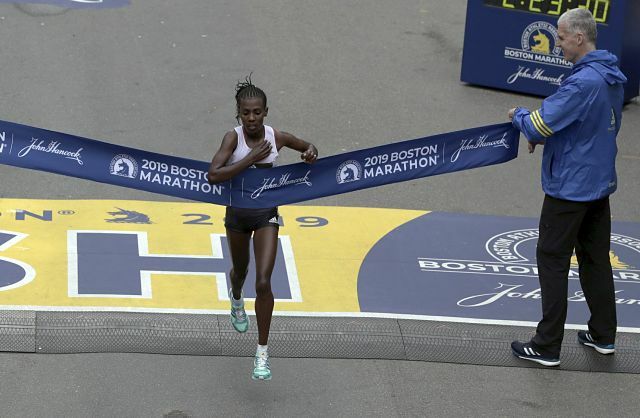 An Ethiopian woman, Atsede Baysa, will also be defending her title after winning in 2:29:19. Berhanu Hayle’s main challengers will include countryman Sisay Lemma, who ran 2:05:16 in Dubai last year, and Kenyans Geoffrey Kirui who ran 2:06:27 in Amsterdam last year and Emmanuel Mutai, who was second in New York and Chicago, and has the field’s fastest personal best of 2:03:13. The hilly Boston course usually leads to slower times than other major marathons. 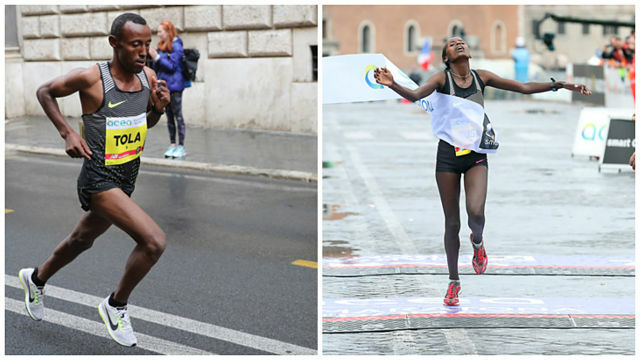 Shura Kitata recorded the second-fastest time ever witnessed at the Acea Rome Marathon while fellow Ethiopian and training partner Rahma Tusa successfully defended her title at the IAAF Silver Label Road Race on Sunday (2). With rain falling heavily in the Italian capital, the men’s race set off at a quick pace. A quartet of pacemakers led the field through 5km in 14:49, 10km in 29:39 and 15km in 44:47 with the splits suggesting a sub-2:06 finishing time. Seven men, not including the pacemakers, went through the half-way point in 1:03:25 and it appeared as though they still had a good chance of breaking the course record of 2:07:17 set in 2009 by Benjamin Kiptoo. But the pace slipped after the last of the pacemakers dropped out at 30km. Four men – Kitata, fellow Ethiopians Werkunesh Seyoum and Solomon Lema, plus Kenya’s Dominic Ruto – were left in the lead pack at that point. Lema was the next to drop behind while the three other men ran together for another five kilometres and reached 35km in 1:46:03, 2:07:51 pace. Kitata knew that if he was to break the course record, he couldn’t hang around any longer. 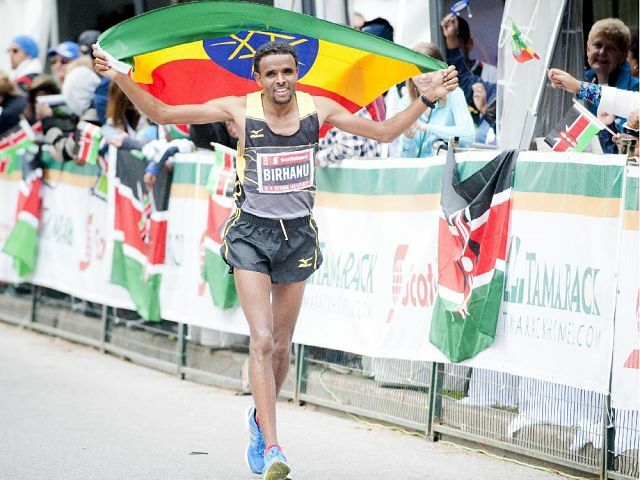 The 21-year-old Ethiopian pushed the pace and dropped his two remaining rivals, opening a gap of almost one minute over the course of five kilometres. Kitata saw the course record figures come and go on the clock before he reached the finish line but he still finished strongly to win in 2:07:30, taking more than a minute off the PB he set on his marathon debut in Shanghai in 2015. New York (TADIAS) — Almaz Ayana, who was named “Female World Athlete of the Year” this past December for her spectacular performance at the 2016 Summer Olympics in Brazil, is featured in the current episode of IAAF’s Inside Athletics exclusive interview series released this week. 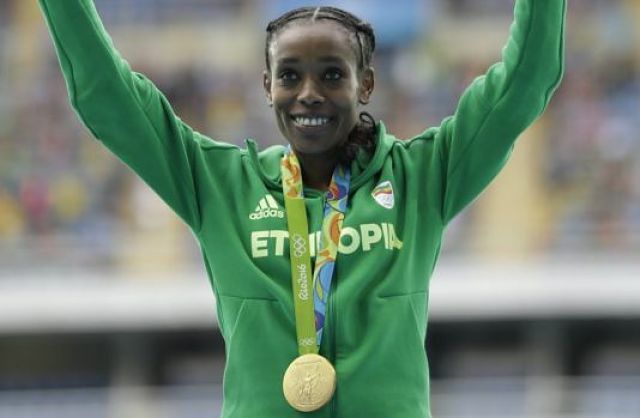 The 25-year-old long distance runner won gold in the 10,000 metres during the Olympics setting a new international record and earning Ethiopia its only gold medal at the competition. 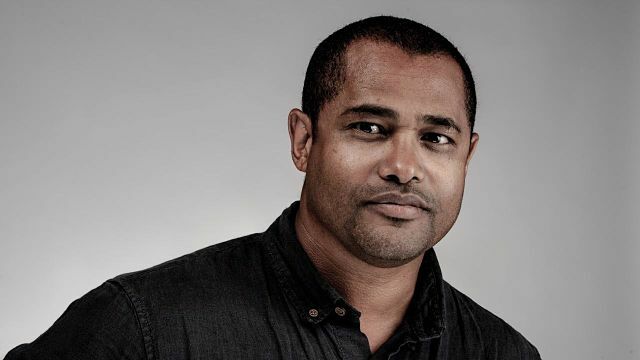 “IAAF Inside Athletics is hosted by Trinidad and Tobago’s 1997 world 200m champion Ato Boldon. To watch episodes of IAAF Inside Athletics as soon as they are released, follow the IAAF World Athletics Club Facebook page. FLAGSTAFF, Ariz. — The young boy was getting reacquainted with his father after an absence of six months and climbed on him as if he were a tree. The boy kissed his father and hugged him and clambered onto his shoulders. Then, when a protest video streamed on television, the boy grabbed a stick, and the lid of a pot to serve as a shield, and began to mimic a dance of dissent in the living room. 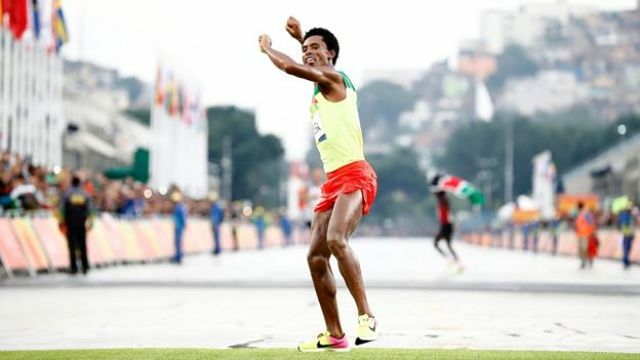 There is much joy and relief, but also continued political complication, in the modest apartment of Feyisa Lilesa, the Ethiopian marathon runner who won a silver medal at the Rio Olympics and gained international attention when he crossed his arms above his head at the finish line in a defiant gesture against the East African nation’s repressive government. 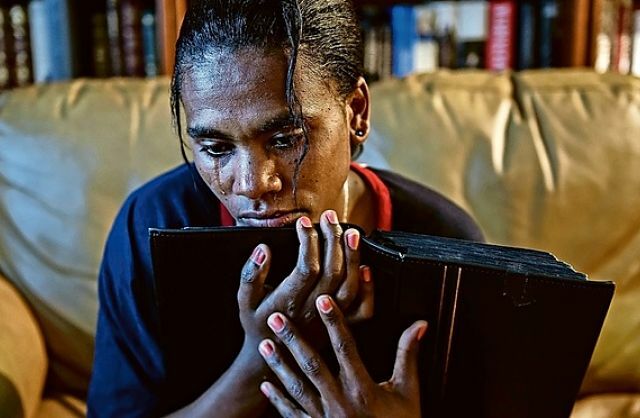 Afraid to return home, fearing he would be jailed, killed or no longer allowed to travel, Lilesa, 27, remained in Brazil after the Summer Games, then came to the United States in early September. He has received a green card as a permanent resident in a category for individuals of extraordinary ability in the sciences, arts, education, business and sports. 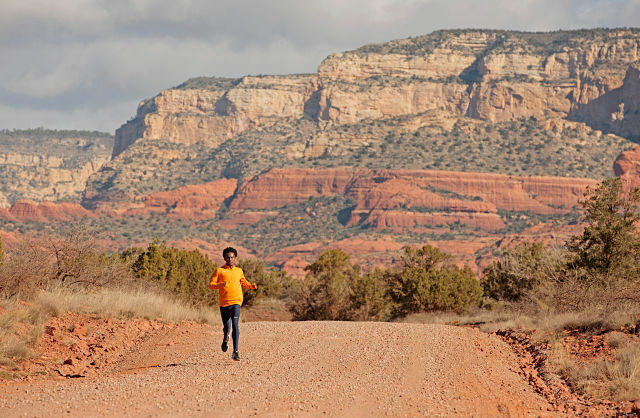 On Valentine’s Day, his wife, Iftu Mulisa, 26; daughter, Soko, 5; and son, Sora, 3, were reunited with him, first in Miami and then in Flagstaff, where Lilesa is training at altitude for the London Marathon in April. Their immigrant visas are valid until July, but they also hope to receive green cards. She went on to stop the clock at 5:23.75, taking almost seven seconds off the world indoor best set by Gabriela Szabo in 1998. 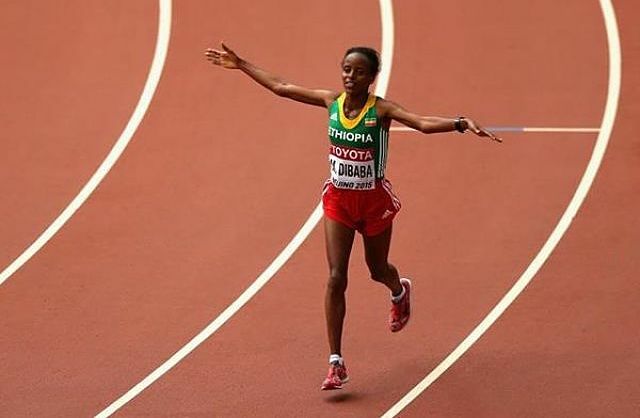 Although the 2000m isn’t an official world record event indoors, Dibaba’s performance – pending ratification – can be classed as an outright world record as it is faster than Sonia O’Sullivan’s outdoor mark of 5:25.36. 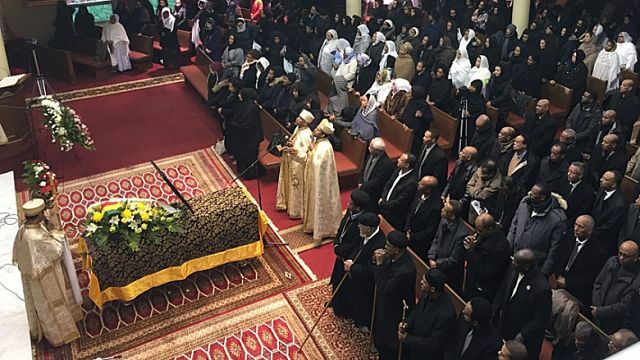 Miruts Yifter, an Ethiopian running legend dubbed “Yifter the Shifter” for his ability to power away from rivals, was laid to rest at a packed funeral in Toronto on Tuesday. Yifter, a distance runner who won two gold medals in the 5,000- and 10,000-metre events at the 1980 Moscow Olympics and won bronze medals earlier at the 1972 Munich Games, died at 72 after battling respiratory problems. 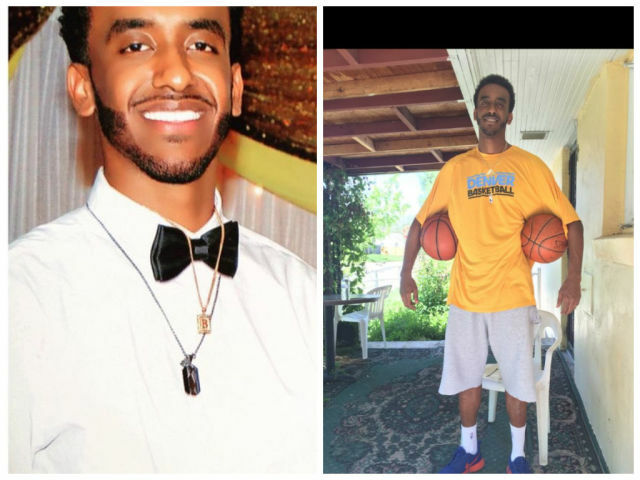 “He’s a national icon,” said Yonas Tadssa, a friend of Yifter’s who also hails from Ethiopia. 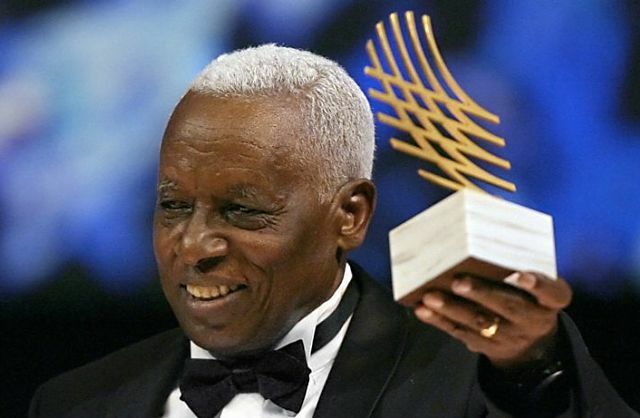 The IAAF is saddened by the news that Miruts Yifter, a double Olympic champion for Ethiopia at the 1980 Olympic Games, died yesterday (December 22) in Toronto, Canada, after being hospitalised for respiratory ailments. Yifter, considered by many as one of the greatest middle distance runners of all-time, was 72. 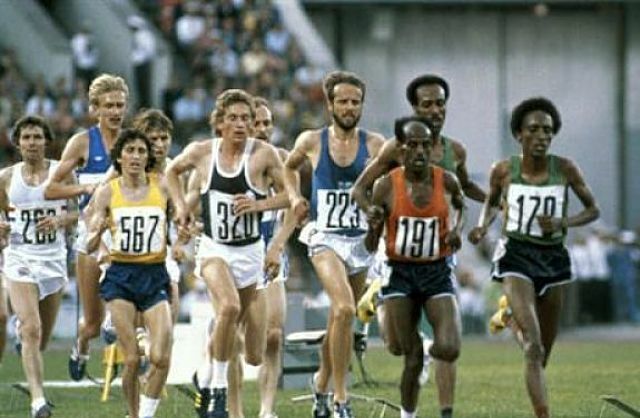 Yifter’s crowning achievement was his 5,000 and 10,000m double triumph at the 1980 Olympic Games in Moscow at age 40, where he earned the nickname “Yifter the Shifter” for the rapid injections of speed that helped propel him to victory. In both contests, Yifter surged and slowed to confuse his key opponents. The tactic worked. “We talked about it with the coaches and I practiced taking off with 300 metres to go in both the 5000 and 10,000m races,” he recalled for a 2004 story on the IAAF website. 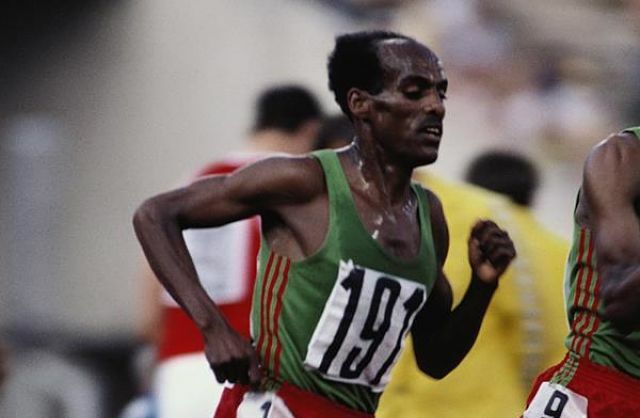 ADDIS ABABA, Ethiopia — Miruts Yifter, an Ethiopian running legend who inspired world-class athletes like Haile Gebreselassie, has died in Canada at age 72, his family and Ethiopian Athletics Federation officials told the Associated Press on Friday. The athlete known widely by the nickname “Miruts the Shifter” won two gold medals at the 1980 Moscow Olympics at age 40 and won bronze medals earlier at the 1972 Munich Games. Miruts’ son, Biniam Miruts, said his father had been suffering from respiratory problems. 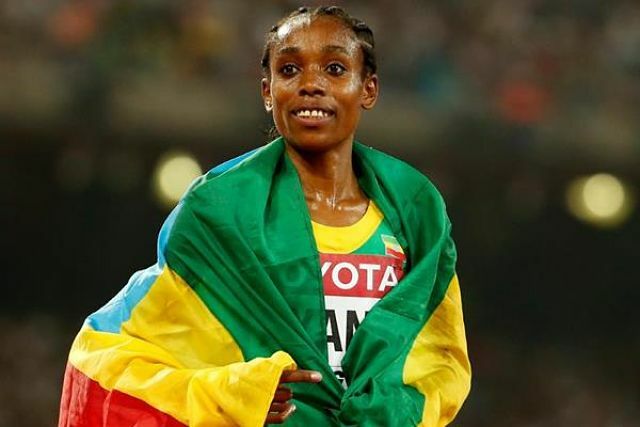 New York (TADIAS) — Ethiopia’s Almaz Ayana who set a new world record in the 10,000m race during the 2016 Olympics in Brazil was awarded this year’s “Female World Athlete of the Year” prize last Friday at a ceremony in Monaco. The 25-year-old long distance runner was accompanied at the event by Haile Gebreselassie who also acted as her translator. “After collecting her IAAF Female World Athlete of the Year award she was asked at what stage during her gold medal run in the 10,000m final at Rio 2016 she realised the world record was also in her grasp,” IAAF reported. Almaz Ayana is the third Ethiopian woman to win “Female World Athlete of the Year” award following in the footsteps of Genzebe Dibaba (2015) and Meseret Defar (2007), according to IAAF. 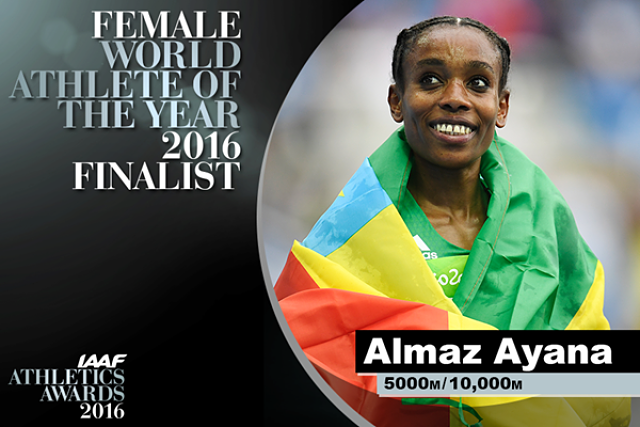 New York (TADIAS) — Almaz Ayana who won Ethiopia’s only gold medal during the 2016 Olympics in Brazil this past summer has been named a candidate for this year’s Female World Athlete of the Year award. 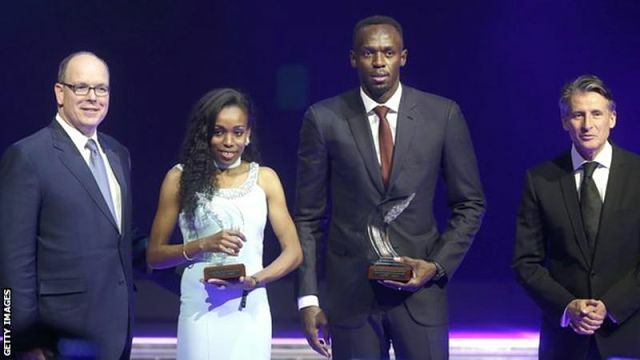 The 25-year-old long distance runner is being considered for the prestigious award along with Jamaican track and field sprinter Elaine Thompson and Polish hammer thrower Anita Wlodarczyk. 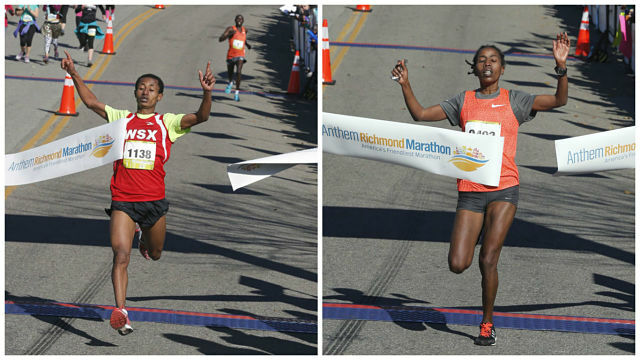 New York (TADIAS) — Dadi Beyene and Bizuwork Getahun of Ethiopia took first place in the men’s and women’s category respectively at this year’s Richmond Marathon in Virginia on Saturday. 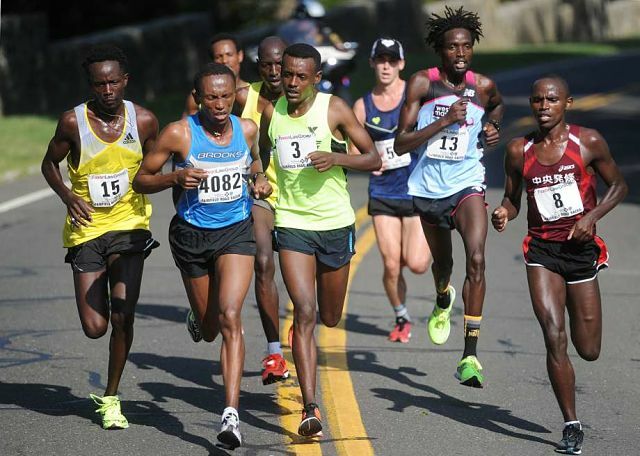 The Times-Dispatch adds: “The winners of the American Family Fitness half marathon this morning were Girma Gebre, of Ethiopia, for the men and Joan Aiyabei, of Kenya, for the women. Gebre ran the half marathon in 1:04:41; Aiyabei finished in 1:12:25. When Tesfaye Jifar sits still, his mind drifts to dark places. So he prefers to remain in motion. It’s easier not to think about any of it: The elite athletic career that accelerated with uncommon speed, and then ended almost as quickly. The livery cab that he now drives throughout Boston, sometimes for 16 hours a day or more. The tense situation back home in Ethiopia, where the government — trying to stifle dissent in the city where Jifar’s wife and children still live — declared a state of emergency last month. And most of all, the loneliness. We stop at a light, and the car stalls. Jifar turns the key, and the engine coughs before finally revving again. For a moment, it seems like the beginning of another crisis, one he can barely afford, but we are soon back in motion. I’d met Jifar four months earlier, in this very car, while on assignment in Boston. A few minutes into a ride to Logan Airport, he asked where I was from. “New York,” I told him. “Do you know about the New York City Marathon?” he said, handing me his smartphone, which showed a photo of a man crossing the finish line with arms raised in the air. I looked at him, then at the picture, then back at him. “Wait, you won the Marathon?” I rubbed my eyes and saw his face smiling back at me in the rearview mirror. Same lean body as the runner in the picture. Same meticulously trimmed moustache. Same right eye, glassy and half-closed. “Yes,” he said, pulling up his Wikipedia page on his phone, quickly and without compromising his focus on the road, as if he has done this a thousand times. He passed it back to me. 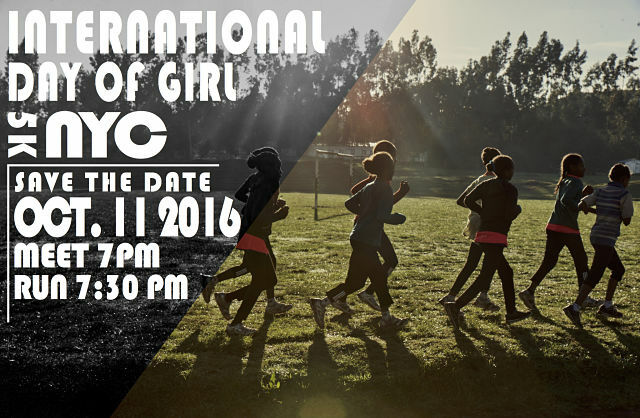 New York (TADIAS) — This week as part of the International Day of the Girl celebration, Girls Gotta Run Foundation (GGRF) is hosting a 5K run in New York in collaboration with groups throughout NYC as well as a fundraising dinner event on Tuesday at Marcus Samuelsson’s Street Bird Restaurant in Harlem. The event on Tuesday is hosted by Harlem Run, Black Roses NYC and Street Bird Restaurant. “We would like to invite the NYC Ethiopian community and NYC-based Ethiopian runners to join us in this event in Harlem,” GGRF announced. In 1982, Girma Aweke arrived in the United States in search of a better life and education. After spending his early years in Ethiopia, he made his way to San Jose State University, where he studied engineering. Seble Demissie, the second youngest of eight children, arrived in the USA in 1987 after earning her undergraduate degree in Ethiopia with the same goals. She did some short term training at the University of Pittsburgh and then earned her MBA at Long Beach State. It was in Northern California, among the tight-knit Ethiopian community, that the two met, fell in love, married in 1995, and settled in San Jose. Living out their version of the American dream, he as an engineer in the medical field and she working in finance and banking. Both became American citizens, and they had two children, son Nathaniel and daughter Naomi, who was born in 2000. 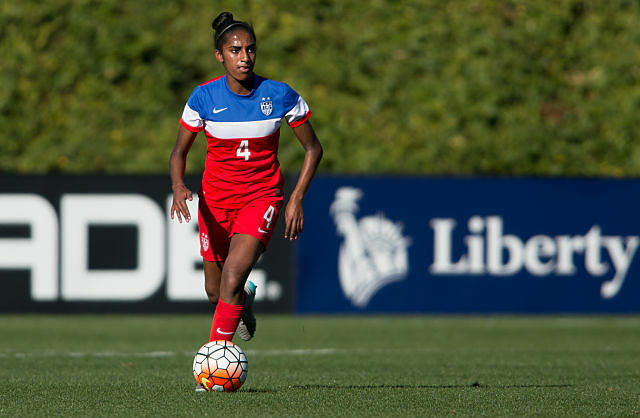 Sixteen years later, the daughter of immigrants, a first generation American, is on the cusp of representing – and perhaps captaining — the United States in a youth Women’s World Cup. 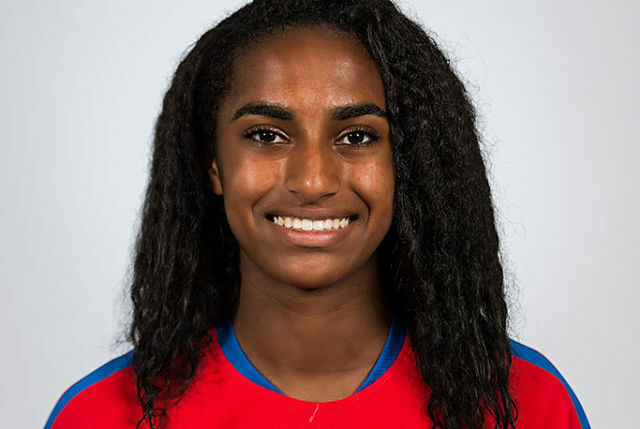 It was the Ethiopian community that first drew Naomi Girma to soccer. (In Ethiopia, the children take the first name of their father as their last name). Girma Aweke was one of the organizers of “maleda soccer” (maleda meaning “dawn” in Amharic, the official language of Ethiopia), a gathering of Ethiopian families that served to strengthen the bonds of the community. Through these free play weekend afternoons, which also featured other sports and a big BBQ to end the day, Naomi’s love for the game was nurtured. At age nine, she started playing club soccer for the Central Valley Crossfire and grew into one of the USA’s elite female players for her age. 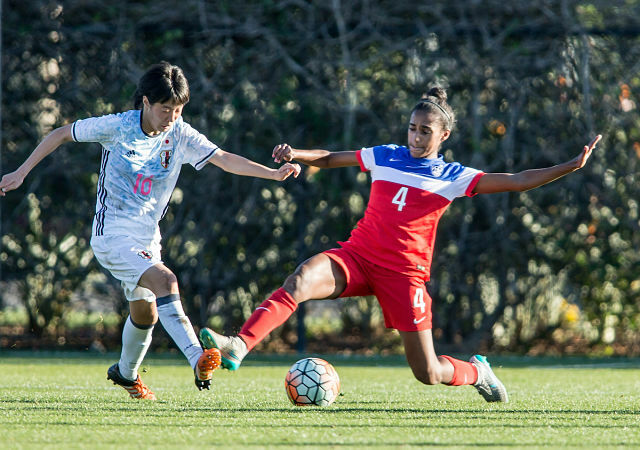 She has committed to Stanford University for the fall of 2018 and has captained the U.S. U-17 WNT on several occasions. The women’s race saw Ethiopia’s Aberu Kebede take victory in commanding fashion, running 2:20:45 to come home more than three minutes clear of compatriot Birhane Dibaba. Kebede, Dibaba and fellow Ethiopian Ruti Aga ran together through 10km in 33:12 and 15km in 49:40, but Kebede began to press on alone before halfway, which she reached in 1:09:27. From there, she extended her advantage all the way to the finish, coming home just 15 seconds shy of her personal best of 2:20:30. 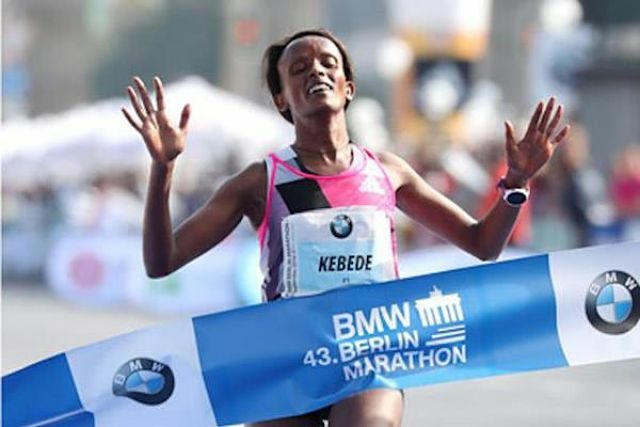 With her third Berlin win after 2010 and 2012, Kebede joins the city’s record winners Uta Pippig (Germany) and Renata Kokowska (Poland). Birhane Dibaba (2:23:58) and Ruti Aga (2:24:41) made it an all-Ethiopian podium in Berlin. 41,283 runners from 122 countries entered the 43rd edition of the race, which is part of the Abbott World Marathon Majors. 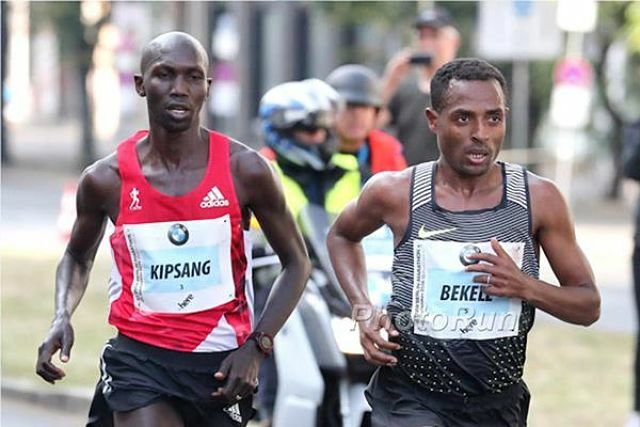 Ethiopia’s Kenenisa Bekele emerged victorious in a battle for the ages with Kenya’s Wilson Kipsang during the BMW Berlin Marathon on Sunday, an IAAF Gold Label Road Race. His winning time of 2:03:03 was an Ethiopian record and the second fastest time in history on a record-eligible course. 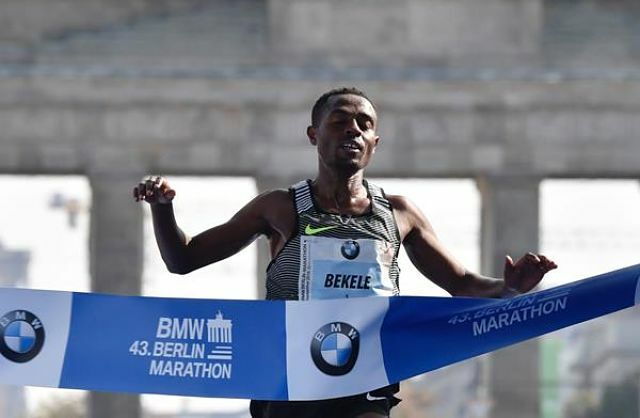 Bekele took command of the race entering the final kilometre, surging away from former world record holder Kipsang to take his first victory in Berlin, smashing Haile Gebrselassie’s Ethiopian record of 2:03:59 in the process. The 5000m and 10,000m world record holder steadily reeled in his target over the kilometres that followed, clocking off consistent splits and running alongside Kipsang at the 40km mark before unleashing his decisive move. Bekele changed gears impressively with just over a kilometre to run, a move Kipsang simply couldn’t match. With nothing but the clock left to race, the 34-year-old Ethiopian powered up the home straight in the shadow of the Brandenburg Gate, but fell just short in his bid to break the world record of 2:02:57. 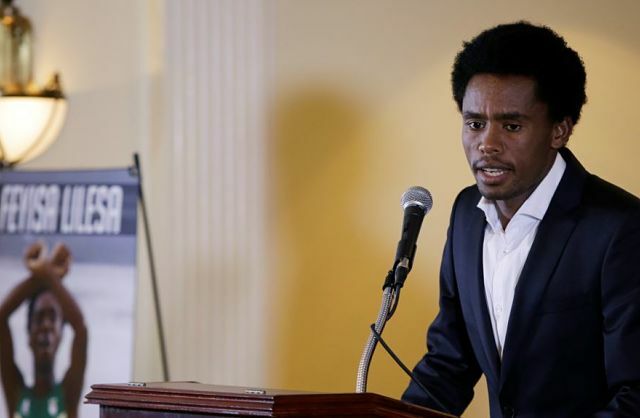 The Ethiopian Olympic medallist who publicly protested against the country’s government has arrived in the United States, where he reportedly hopes to claim asylum. 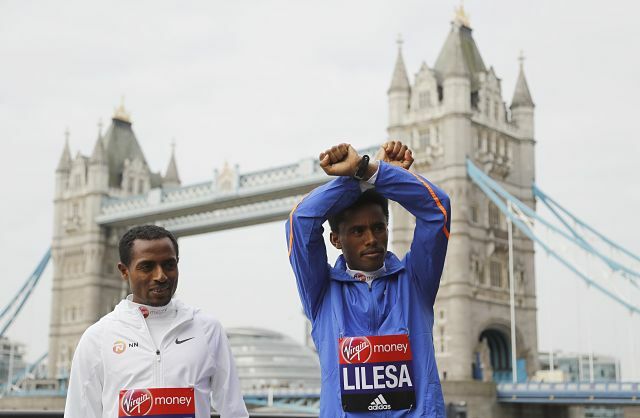 Feyisa Lilesa, who won the silver medal in the men’s marathon at the Rio 2016 Olympics, crossed his arms over his head as he finished the race. The gesture has become common among protesters in Oromia, a region of Ethiopia where hundreds of Oromo activists have been killed in recent months during clashes with security forces. 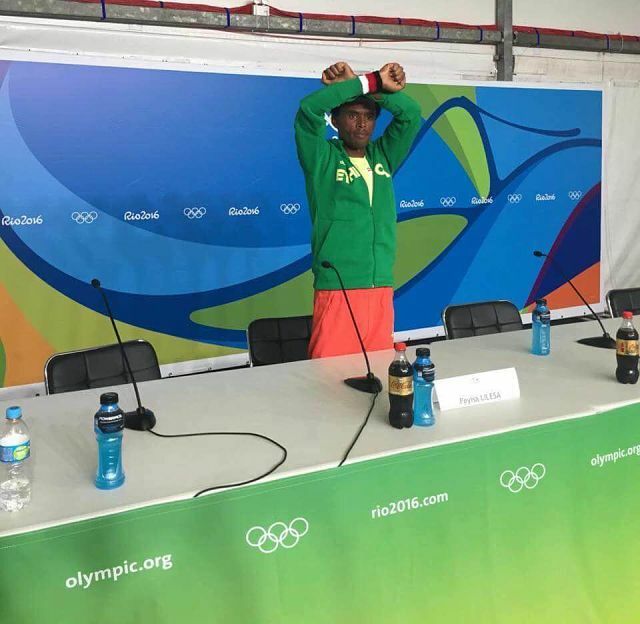 Lilesa repeated the gesture at a later press conference and during his medal ceremony, adding that he would likely be killed or imprisoned if he returned to the Horn of Africa country. Ethiopia’s information minister Getachew Reda told the BBC at the time that Lilesa would have nothing to fear if he returned home. The runner has now reportedly arrived in the U.S. after previously stating that he would seek asylum in the country, the BBC reported on Friday. 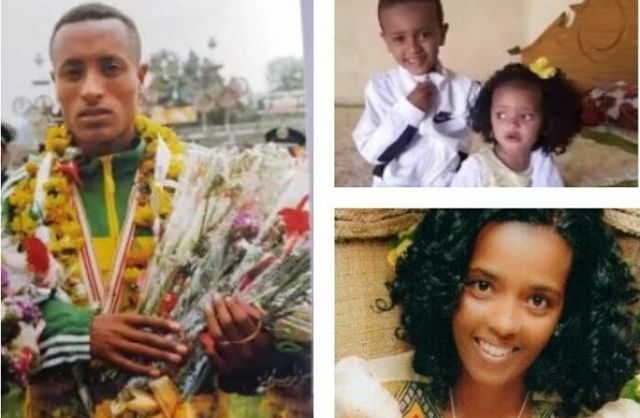 A crowdfunding campaign set up to fund Lilesa’s legal fees and support his family in Ethiopia has raised more than $160,000 in under three weeks after it was set up on August 21. 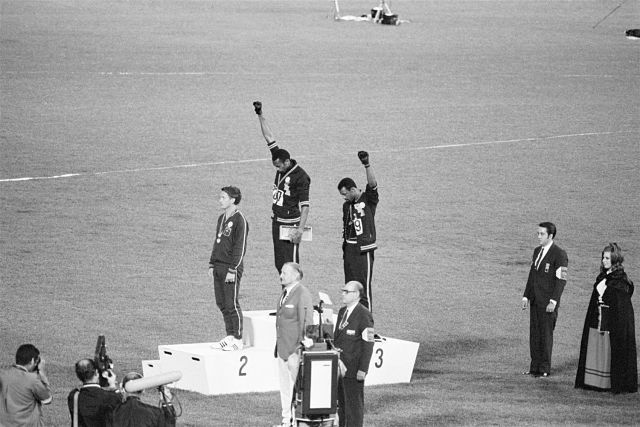 New York (TADIAS) — In 1968 three athletes wore Olympic Project for Human Rights (OPHR) badges during the medal ceremonies in support of the civil rights movement in America despite a ban on political demonstrations at the Olympics. 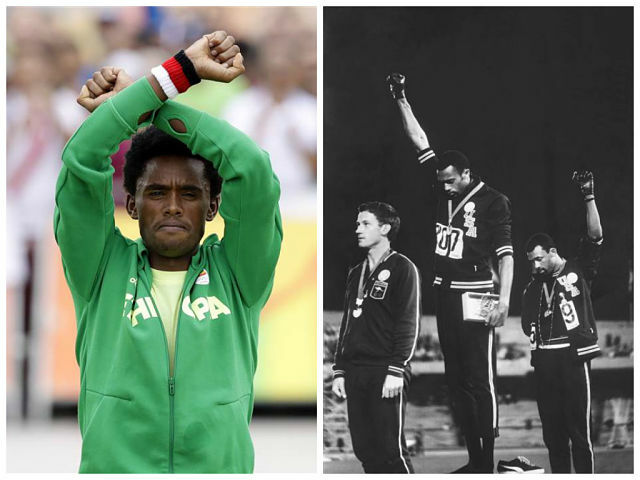 At Rio 2016 Ethiopian Olympic marathoner & silver medalist Feyisa Lilesa staged an equally daring protest as he crossed the finish line on Sunday, August 21st holding his arms over his head, with wrists crossed, in a gesture of solidarity with non-violent protestors in Ethiopia regarding government plans to reallocate farmland and freedom of expression. He repeated the protest at a press conference and on the podium. 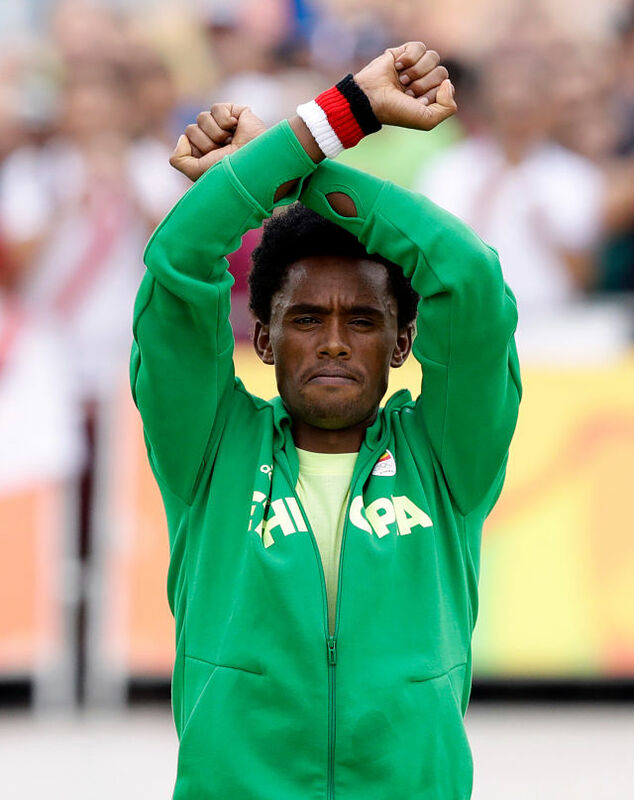 When he crossed the Olympics marathon finish line, Feyisa Lilesa put his hands above his head in an “X.” Most of those who watched Lilesa’s spectacular silver medal performance didn’t know what that meant — or just how dangerous a protest they were watching. Lilesa was protesting the Ethiopian government’s killing of hundreds of the country’s Oromo people — an ethnic majority that has long complained about being marginalized by the country’s government. The group has held protests this year over plans to reallocate Oromo land. Many of those protests ended in bloodshed. According to Human Rights Watch, more than 400 people have been killed since November. 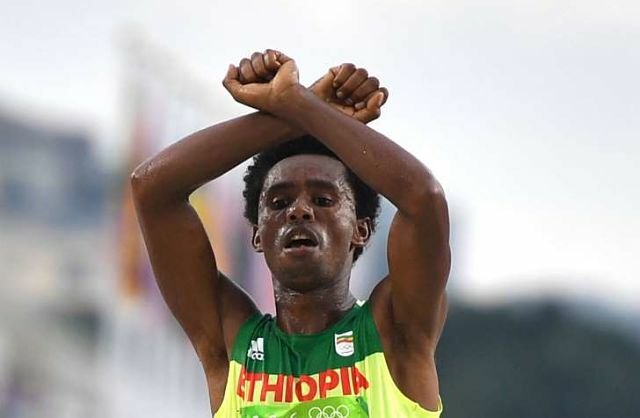 For months, the Oromo have been using the same “X” gesture that Lilesa, 26, used at the finish line. At a news conference following the race, he reiterated his defiant message. 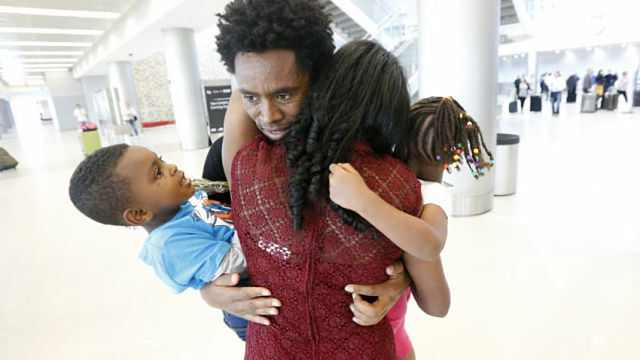 It was a remarkable turn of events — within seconds, Lilesa had gone from a national hero to a man who might not be able to return to his home country. In addition to those killed, many Oromo protesters are currently languishing in prison. 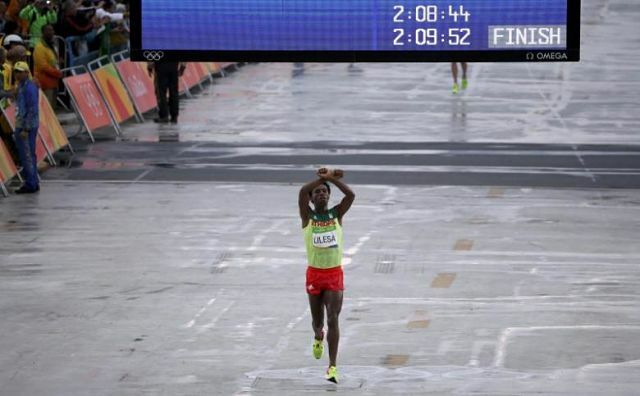 In Ethiopia, the state broadcaster did not air a replay of the finish. Lilesa was conscious of the danger. He immediately suggested that he might have to move somewhere else. “If I go back to Ethiopia maybe they will kill me. If not kill me, they will put me in prison. I have not decided yet, but maybe I will move to another country,” he said. 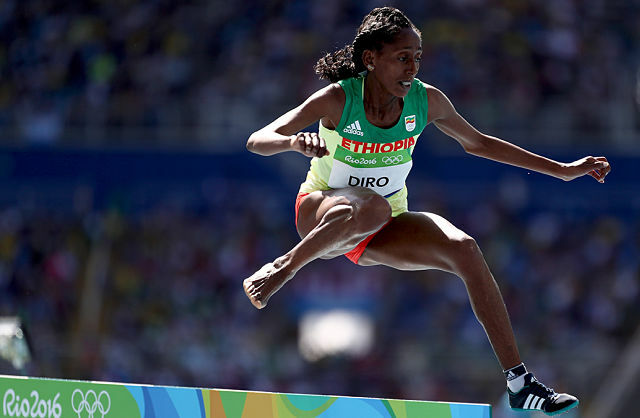 Ethiopia’s Etenesh Diro has advanced to the final in the women’s 3,000-meter steeplechase after having run the last half mile of the semifinal with only one shoe. 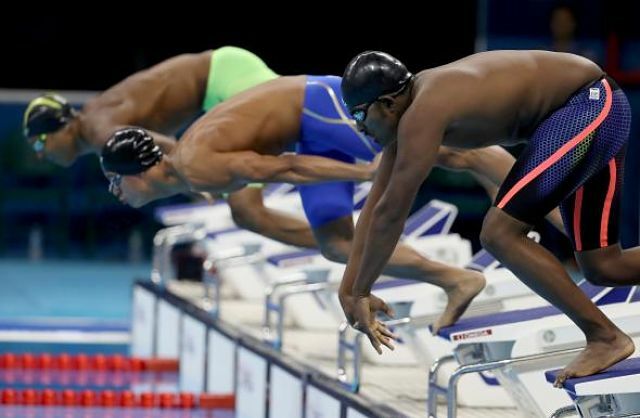 After reviewing video of the race, the Jury of Appeal advanced Diro to the final, following protests from the Ethiopian team, according to The Associated Press. Diro was leading her heat in the qualification race when her right shoe got loose. The 25-year-old struggled to put it back on after colliding with some of the others on the track. After trying to put it back on, Diro finally yanked it off and threw it onto the field. Taking a few steps, she ripped off her sock and continued, completing the last leg of the race with just one shoe. Diro managed to catch up to some of the runners, but finished in 7th place in her heat, clocking in at 9:34.70. That time originally knocked her out of the final. New York (TADIAS) — From now until August 21st all eyes are focused on Brazil as the 2016 Olympic Games officially got underway there on Friday evening with a colorful ceremony broadcasted around the world from the seaside city of Rio De Janeiro. According to the International Olympic Committee at least 206 countries are represented by more than 11,000 athletes at the 2016 Rio Games this summer, which is being held in South America for the first time. “In total, there will be 306 events over the course of 19 days between the opening and closing ceremonies,” highlights The Root, while naming a member of Ethiopia’s team, Genzebe Dibaba — the current world record holder in both the indoor and outdoor 1500 meters race — among 40 black athletes worldwide to watch for at the 2016 competition. Genzebe, who additionally holds the world indoor record in the 3000 meters category will “narrow her focus and compete over 1500m, the event at which she holds the world record at 3:50.07,” IAAF reported last month. IAAF added that her elder sister Tirunesh Dibaba — three-time Olympic gold medalist and the reigning Olympic 10,000m champion — is also “slated to compete solely over that distance in Rio, though she is also listed as a reserve for the 5,000m.” Genzebe’s family members who are also Olympians include her silver medalist sister Ejegayehu Dibaba, as well as her cousin Derartu Tulu who was the first female Ethiopian gold medalist. 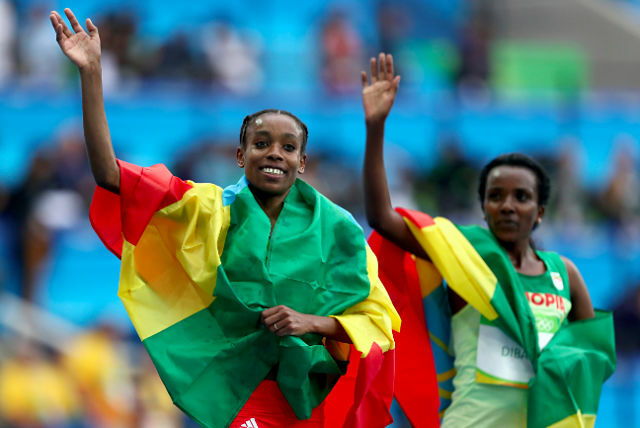 New York (TADIAS) — Ethiopia’s long-distance team for the Rio 2016 Olympic Games, which is set to kick-off in Brazil next month, includes 24-year-old Almaz Ayana who is aiming to score a double victory in the 5000m and 10000m following in the footsteps of Tirunesh Dibaba’s historic win in both fields at the Beijing Olympics in 2008. 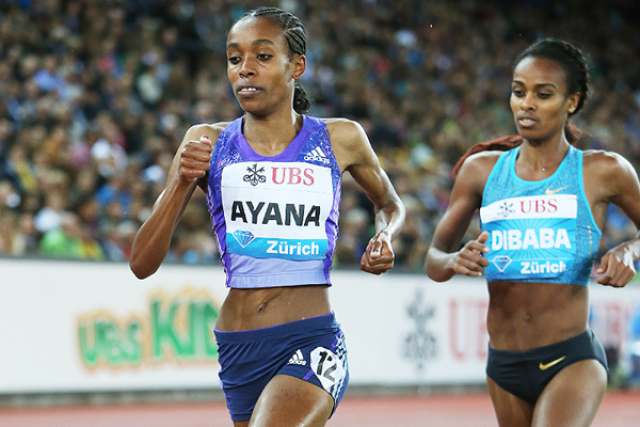 “Ayana tops the world lists at both distances this year, having run 14:12.59 for 5000m at the IAAF Diamond League meeting in Rome and 30:07.00 for 10,000m in Hengelo last month,” according to the International Association of Athletics Federations (IAAF). New York (TADIAS) — Ethiopia’s Kenenisa Bekele is among the world’s “Greatest Olympic Athletes Of All Time,” according to a new athletics statistics handbook for the Rio 2016 Olympic Games published this week by the International Association of Athletics Federations (IAAF). The handbook, which also highlights the records of Ethiopian greats such as Abeke Bekila, Mamo Wolde, Miruts Yifter and Haile Gebrselassie, points out that Kenenisa is by far the most successful male Ethiopian Olympic athlete of his generation, topping the “All Male Events” category as well as leading in “Individual Events” and the “Best Athlete by Country.” Kenenisa is currently the Olympic and World Record holder in both the 5000 meters and 10,000 meters categories. The publication, released only four weeks ahead of the 2016 Summer Olympics in Brazil, includes “all-time medals tables, statistics on the oldest and youngest athletes in Olympic history and a full country index,” according to IAAF. In the Olympic records book Kenenisa is closely followed by fellow Ethiopian Tirunesh Dibaba, the current 10,000 meters Olympics record holder in the women’s category, who is also listed among the world’s “Greatest Olympic Athletes Of All Time” along with her cousin Derartu Tulu, Gete Wami and Meseret Defar. 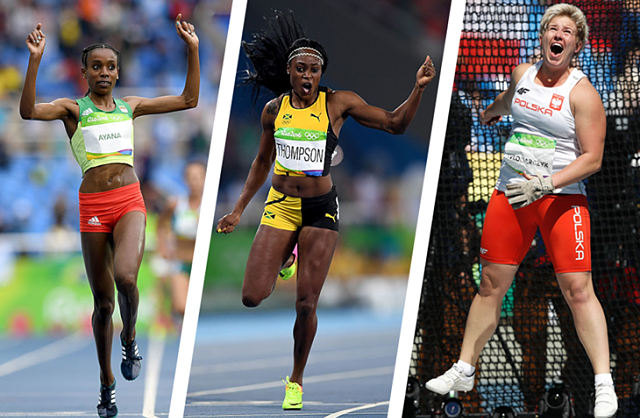 The 2016 Olympic Games commences in Rio from 12-21 August. Ethiopia has been sending cyclists to the Olympic Games since the 1950s but has never sent a rider to the Tour de France. Until now. Tsgabu Gebremaryam Grmay is competing this year before racing in the Brazil Olympics next month. “I’m so excited because I’ve never done this race,” he says with less than 24 hours to the first stage. “For me the Tour de France is not just about finishing 21 stages. It’s about doing something special. I’m ready to do something in this tour. He’s riding in the Italian team Lampre-Merida that includes the powerful Rui Costa and the young South African Louis Meintjes. The squad will be chasing stage wins and a good showing in the general classification. Tsgabu comes from Ethiopia’s northern highlands. The air is thin in his hometown of Mekele, which sits at over 2000m. 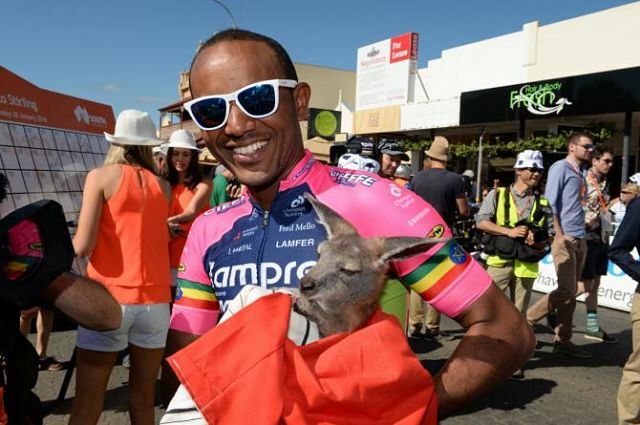 He returns often from the Lampre Merida base in Italy and trains in the roads around Mekele. He only has enough paved road for three hours on the bike. After that he has to ride the same roads again. 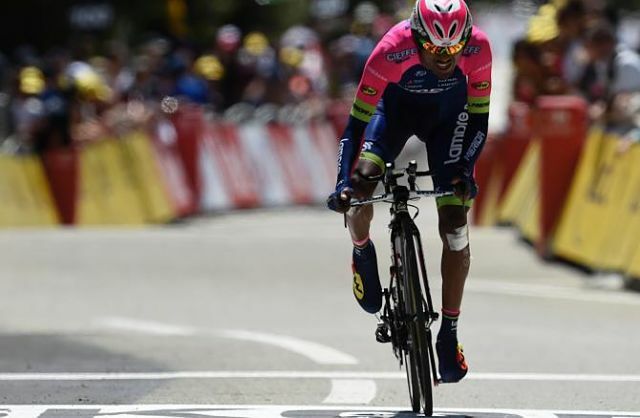 Although it was not easy to watch European cycling six or seven years ago in Mekele, he says, now there are plenty of free-to-view satellite channels that show the big Tours. This means Ethiopia will be watching Tsgabu as the Tour rolls round France. FAIRFIELD – A good finishing kick was all that Ethiopia’s Tsegaye Getachw needed. Getachw was part of a five-man group that broke away from the rest of the field early in the race and then took turns taking, and retaking the lead as the pack got closer to the finish line. But in the end, it was Getachw that broke away from the group and sprinted to victory in the 36th annual Faxon Law Group Fairfield Half Marathon Sunday morning at Jennings Beach. Getachw’s winning time was 1:05.23 over the 13.1-mile course that winds through the streets of Fairfield, Southport, Greenfield Hills and Westport. Fellow Ethiopians Ayele Megersa Feisa and John Gathaya Muruga finished second and third, respectively, in 1:05.27 and 1:05.56. A little more than 3,700 runners competed in the half marathon with an additional 1,600 runners taking part in the 5K event, which took place on Saturday. Getachw won the $2,000 first prize while Feisa took $1,000 for finishing second. Muruga won $500 for third, Julius Koseki of Morristown, N.J., was fourth (1:06.26) and won $300 and Louis Serafini was fifth (1:06.38) and won $200. 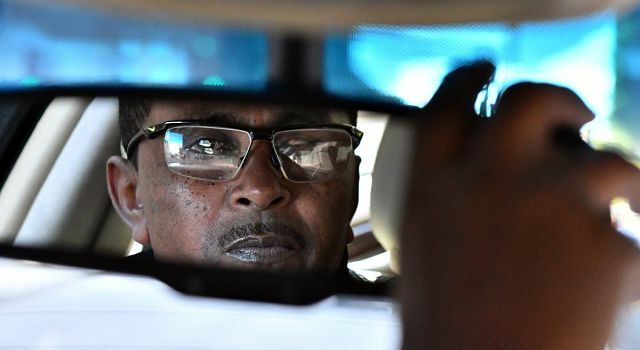 New York (TADIAS) — A son of refugees Krubiel Workie was born and raised in Aurora, Colorado — a suburb of Denver that is home to a sizeable population of immigrants from Ethiopia. A talented basketball player, Krubiel is presently training with The Denver Nuggets. 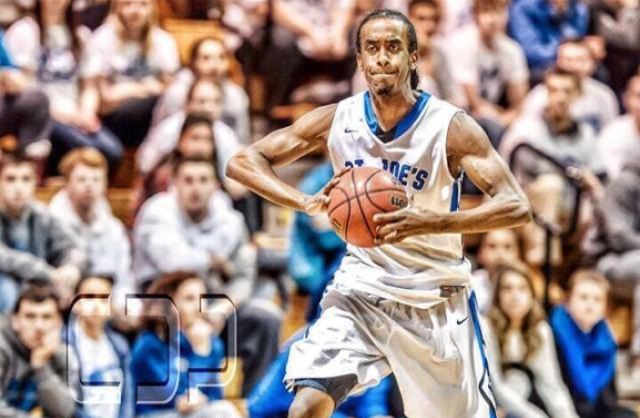 Krubiel’s strong work ethic is helping him prepare for an upcoming basketball boot camp this Summer in Nevada where professional basketball coaches, agents and recruiters will be scouting for new NBA talents. You can connect with Krubiel Workie on Instagram at krubiel_workie or on Twitter @blessed1flight. 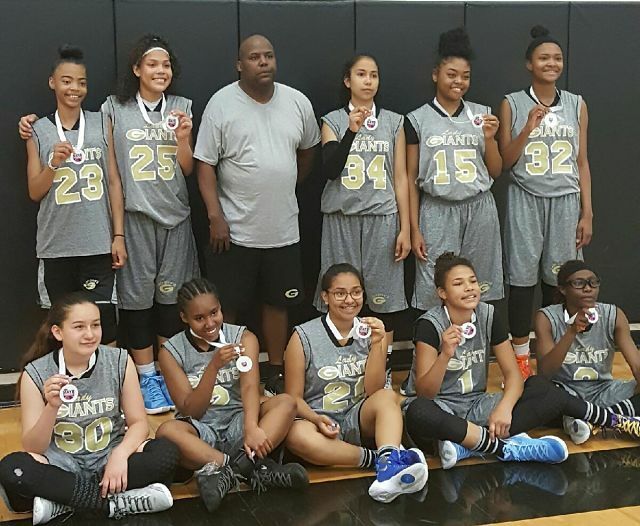 New York (TADIAS) — An African American Girls Basketball Team, The Green Valley Ranch Youth League (GVRYL) in Aurora, Colorado recently received financial contributions from former Emperor Haile Selassie’s family, which made it possible for them to participate in a competition in Kansas this month. 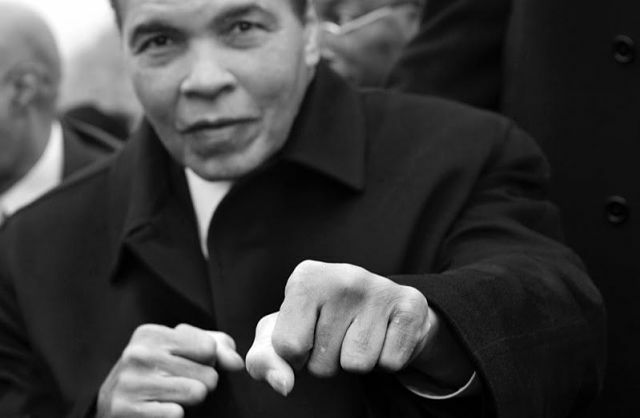 New York (TADIAS) — In honor of boxing legend Muhammad Ali, who passed away on Friday at the age of 74, Ethiopian American photographer Gediyon Kifle shared with Tadias the photograph above of the former world heavyweight boxing champion. Gediyon took the photo in 2013 at an event in Washington, D.C.
Ali, who had struggled with Parkinson’s disease for the past three decades, died on Friday, June 3rd, 2016 at a hospital in Phoenix, Arizona surrounded by his children and extended family who had gathered around him from across the United States, a spokesman for the Ali family, Bob Gunnell, told the media. Dino Sefir and Koren Jelela beat the heat and they beat the fields to win Scotiabank Ottawa Marathon titles on Sunday. The Ethiopian runners pulled away from their nearest remaining competitors with between nine and 12 kilometres remaining and cruised to the men’s and women’s titles and their respective first-place bonuses of $30,000 U.S.
Sefir crossed the finish line on the Queen Elizabeth Driveway with a time of two hours eight minutes 14 seconds, 1:50 faster than compatriot Shura Kitata. The next three spots went to Kenyans Dominic Ondoro (2:11:39), Evans Ruto (2:12:55) and Luka Rotich (2:17:15), who finished second in the Ottawa race two years ago. 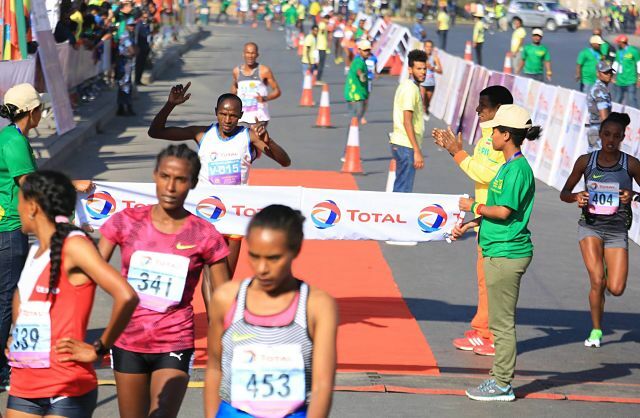 Following Jelela to the end of the official 42.195-kilometre course were 2015 champion Aberu Makeria (2:29:51) and two other Ethiopians, Sechale Delasa (2:32:46) and Makida Abdela (2:34:29), with Tarah Korir of St. Clement, Ont., claiming fifth place and top spot among Canadians with her time of 2:35:46. 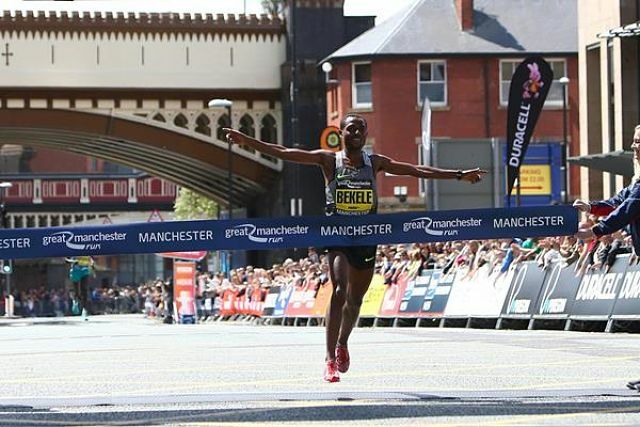 LONDON – Ehtiopia’s Kenenisa Bekele won the 10km Great Manchester Run on Sunday before expressing his frustration at being overlooked by his country’s selectors for the Olympic Games in Rio. The three-times Olympic champion finished the Manchester race ahead of Kenya’s Wilson Kipsang in 28 minutes and eight seconds. 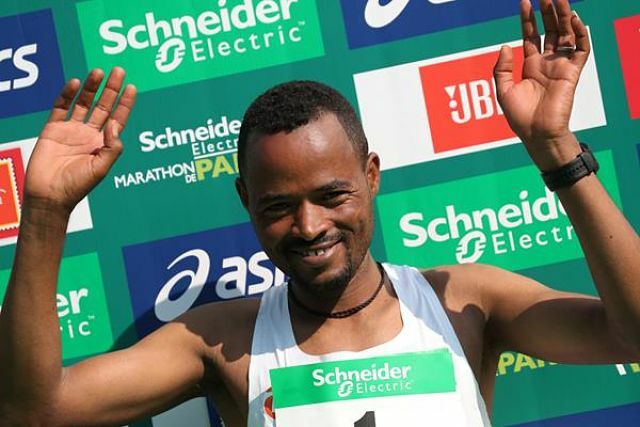 Bekele, who returned from a long period out with injury to finish third in last month’s London Marathon, is only a reserve for Ethiopia’s marathon team for Brazil and has virtually ruled out trying to make the track team. After Sunday’s race, which he also won in 2014, he expressed his displeasure at being overlooked for the Olympics. 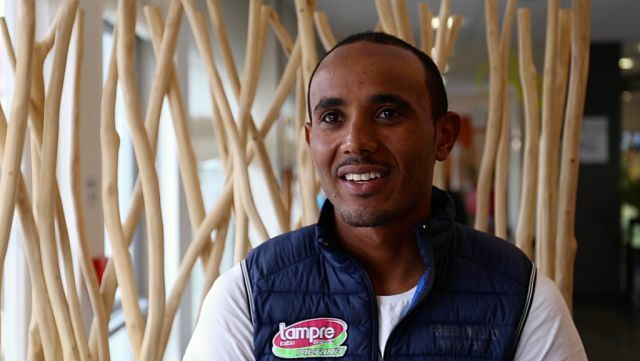 “I’m not happy about that…there is no-one better than me in the marathon in Ethiopia,” he said. 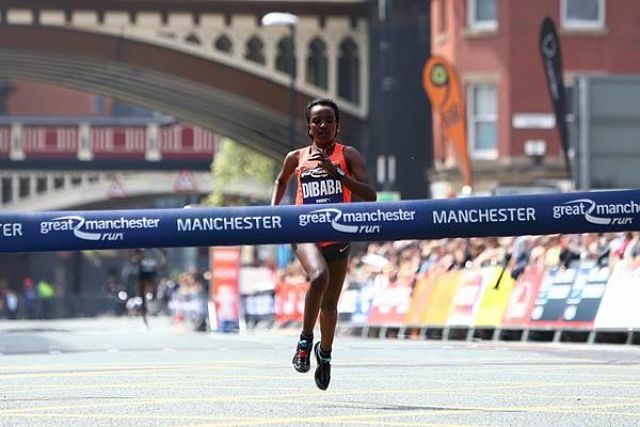 Tirunesh Dibaba made a winning return to competition after a two year hiatus and she also created a small piece of history by becoming the first woman to claim three victories in the Great Manchester Run, an IAAF Gold Label Road Race, on Sunday (22). Keen to blow away the cobwebs in her first race back, Dibaba unusually took up the lead just before the two kilometre mark – a position which she barely yielded for the remainder of her comeback race. The order remained the same through the eight kilometre mark in 25:03 and for a short while, an upset appeared to be on the cards. Kiplagat moved into the lead for the first time while Dibaba was looking laboured. But Dibaba stayed in contact before striking the front with about 600 metres remaining. It might not have been a vintage showing but the world 5000m record-holder proved she is likely to be a force this summer on the basis of her victory this morning in 31:16 to move to third on the 2016 world lists. BOSTON — Atsede Baysa only appeared to drop out of contention in the hills outside of the city. She was actually just being patient. 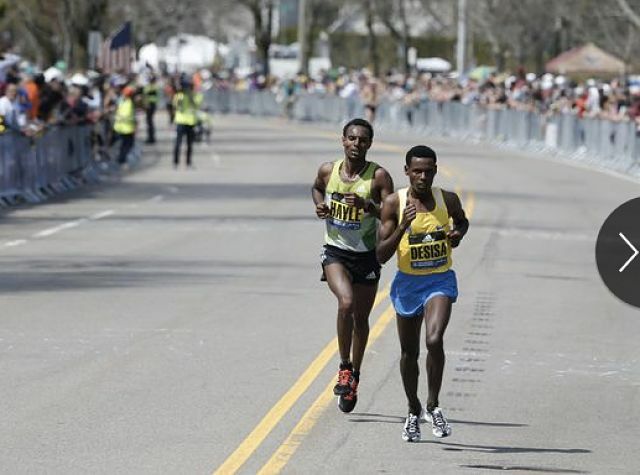 Baysa rallied from a deficit of 37 seconds with 4 miles to go, catching up to the leaders and cruising past them to lead a sweep for Ethiopia in the Boston Marathon on Monday. Did she ever. Baysa leaped from nowhere in sight to striding all alone down Boylston Street and finished with a time of 2 hours, 29 minutes and 19 seconds. 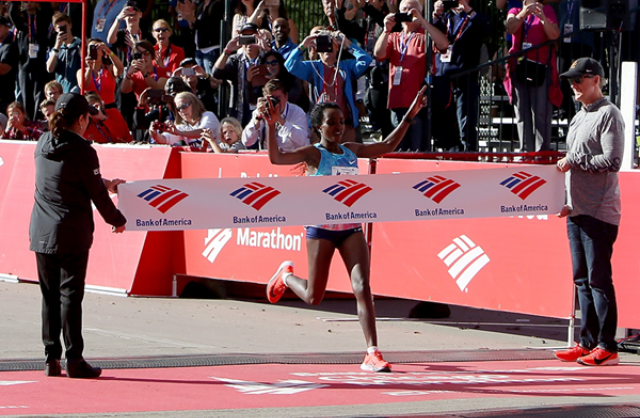 Tirfi Tsegaye of Ethiopia was second (2:30:03) and Joyce Chepkirui of Kenya took third (2:30:50). 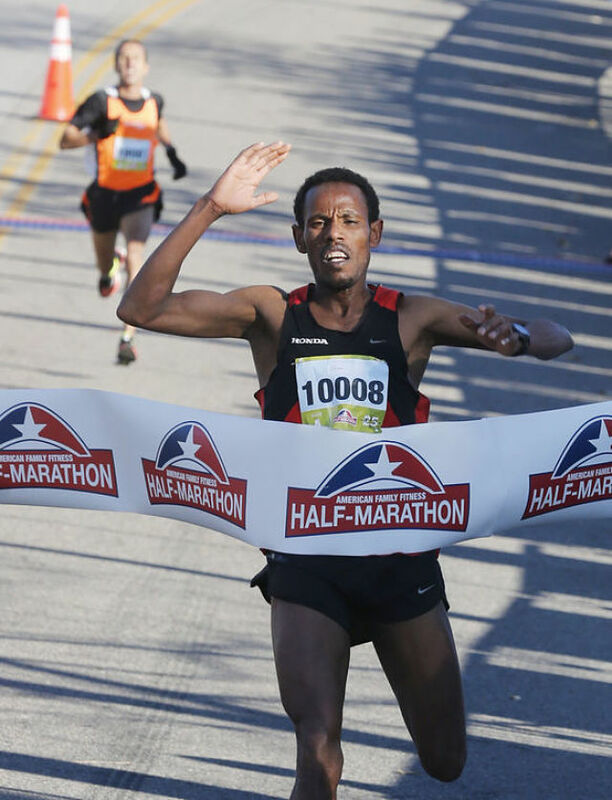 In the men’s race, Lemi Berhanu Hayle broke away from defending champion Lelisa Desisa over the final mile to claim his first marathon title and complete the first sweep for Ethiopian runners in the Boston Marathon. Runners from the same country hadn’t won both the women’s and men’s crowns since Kenya’s Sharon Cherop and Wesley Korir in 2012. Baysa’s win was the biggest surprise, especially considering the wide gap between her and three runners more than half a minute ahead around the 22-mile mark. They’re both 18, both high-school seniors in Massachusetts, both headed into their final season on the track team competing in the mile and two-mile. If you see one running, you’ll probably see the other. Alemseged always loved running but mostly because he played soccer. 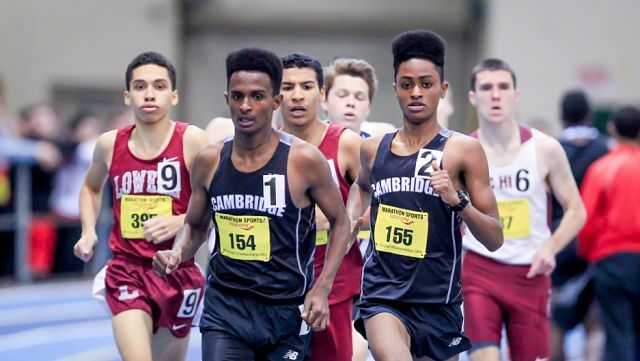 When the two friends got to Cambridge Rindge and Latin School, Aschale persuaded his friend to try cross-country. Alemseged almost quit after the first practice, because it was so gruelling. But he soon discovered he had raw talent. The coach he’s talking about is Scott Cody. Cody ran for Cambridge 30 years ago and he’s been back coaching for 20. He likes to point out that includes 60 running seasons, when you count cross-country, indoor track and outdoor track. He says Aschale and Alemseged have helped take the team to another level. Cody didn’t know what to expect when they showed up as freshmen four years ago. “They were sort of hiding in the back,” he says. “Usually I don’t want freshmen there before the season starts. I want to just get the group that I know’s been training over the summer and train them really hard. Both boys say their Ethiopian heritage is a motivating factor in their running. He says sometimes when he runs he pretends he’s back in Ethiopia, where he lived until he was 12. He remembers running all the time there, chasing cars, playing soccer. 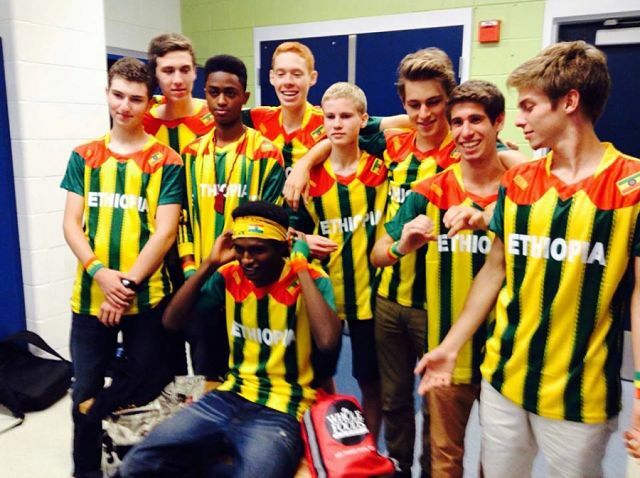 He likes to share his passion for Ethiopia with his teammates. He went back to visit a couple of years ago and came home to Cambridge with an armful of T-shirts for everyone. And with the 2016 Boston Marathon just around the corner, talking about Ethiopia means talking about Ethiopian defending champion Lelisa Desisa. Desisa is beloved in Boston for gifting his 2013 medal back to the city in commemoration of the victims and survivors of the marathon bombings. 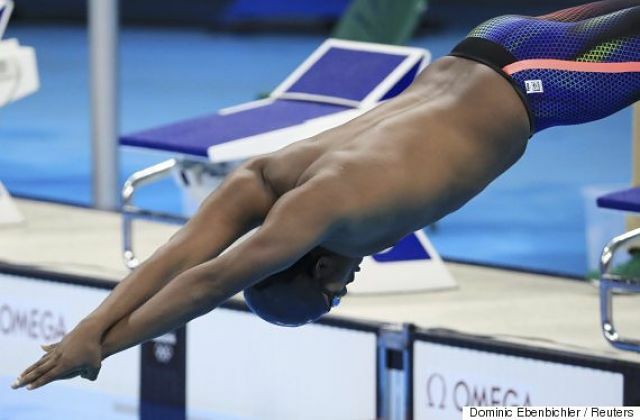 He won again in 2015 and plans to try for another medal on Monday. The only sound at the top of the Entoto Mountains is the thwack of a cowherd’s staff against the tree trunks as he leads his small herd of oxen home. I am doing my best to keep pace with Tirunesh Dibaba, 30, and her younger sister, Genzebe, 25, two wisplike Ethiopians with wide smiles and a fiercely close bond who may be the most formidable female track stars in the world. In the late-afternoon light high above central Addis Ababa, we zigzag between the majestic eucalyptus trees, paying heed to the uneven ground below and staying alert for the not-uncommon hyena sighting—no problem, the sisters assure me, as long as you clap loudly and throw a rock in the animal’s direction. The Dibabas’ dominance in the field of distance running has captivated the track-and-field community. 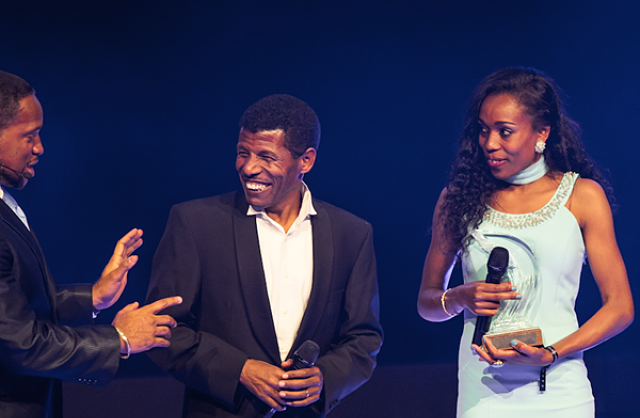 “There are a few running families, but not like the Dibabas,” says the Ethiopian track legend Haile Gebrselassie. These are the only siblings in recorded history to hold concurrent world records, and they are as charmingly unassuming in person as they are fearsome on the track. The sisters were raised three hours south of here, in a tukul, or round mud hut, without electricity—their parents subsistence farmers growing teff, barley, and wheat. Their mother, Gutu, credits her daughters’ success to a loving environment as well as a steady supply of milk from the family cows. 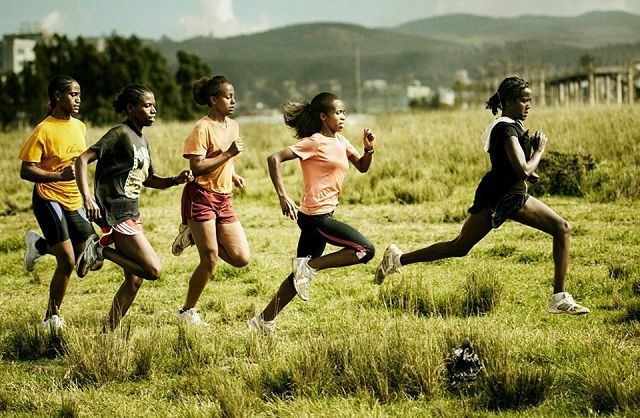 In fact there are seven Dibaba siblings, and all of them run. “What the Dibabas have is what Serena and Venus have, except there are more of them,” says Ato Boldon, NBC’s track analyst. “It’s not a stretch to say they are the world’s fastest family.” Tirunesh is the most decorated, with three Olympic gold medals; Genzebe is tipped to win her first in Rio. Their older sister, Ejegayehu, 34, is an Olympian, too, with a silver from Athens, and their cousin Derartu Tulu was the first black African woman to win an Olympic gold, in the 1992 games. “World records, Olympic medals, world championships—the Dibabas’ accomplishments are unprecedented in this sport,” says Boldon. 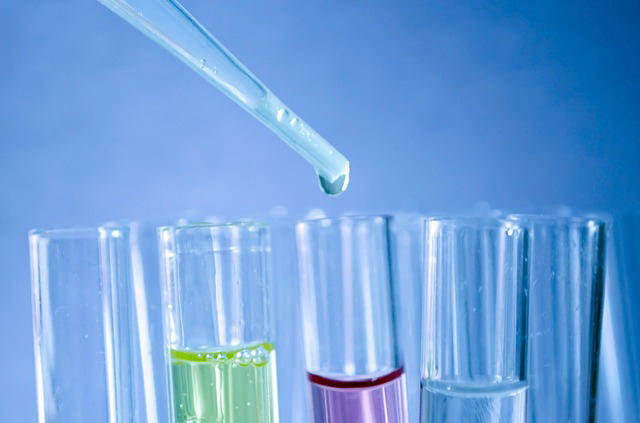 ADDIS ABABA, Ethiopia – The general secretary of Ethiopia’s anti-doping agency says nine of the country’s runners, five of them “top athletes,” are under investigation for doping. Solomon Meaza tells The Associated Press his agency is investigating the five athletes he described as high-profile after they returned “suspicious” results in doping tests. He says the IAAF has requested contact details for the other four and the world body is investigating them. Solomon declined to name the athletes or give details of the substances they are suspected of using as investigations are ongoing. The Ethiopian cases will be another blow to the sport following major doping scandals in Russia and Kenya in the buildup to the Olympics in Rio de Janeiro. 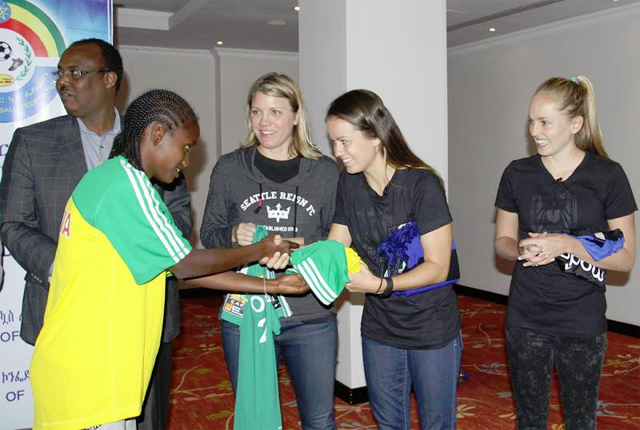 Addis Ababa – The Ethiopian Football Federation and representatives of one of America’s leading professional women’s soccer teams, the Seattle Reign, met today in Addis Ababa and took the first steps in forging a strategic partnership aimed at forging international linkages and strengthening Ethiopian women’s soccer. 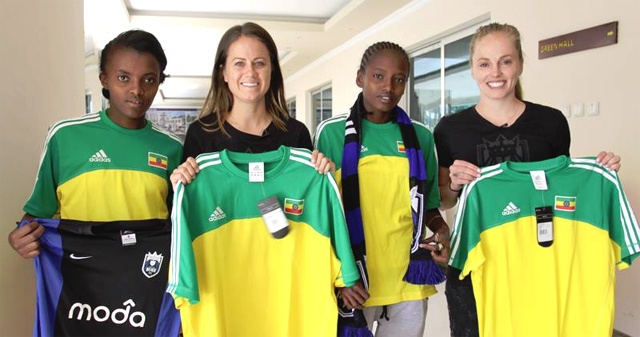 Visiting Seattle Reign co-owner Teresa Predmore, and visiting American women players met with Ethiopian Football Federation officials at the Elili hotel to discuss plans for forging a strategic partnership which would link the Ethiopian National team known as the Lucy’s and the U.S. based Seattle Reign. Representatives of the two teams performed a ceremonial jersey exchange to cement their partnership. 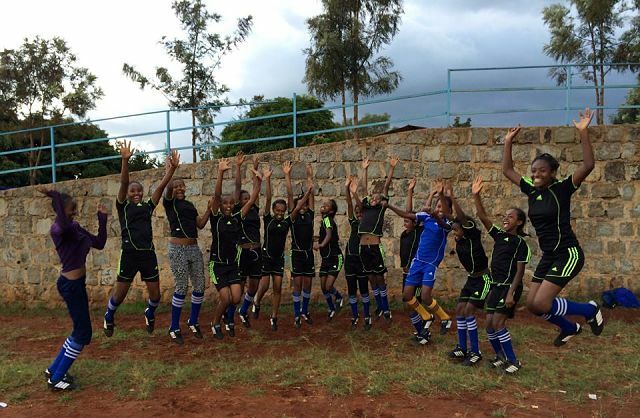 The Seattle Reign FC is an American professional women’s soccer team based in Seattle, Washington. The team plays in the professional National Women’s Soccer League. The Reign finished the 2015 season in first place clinching the NWSL Shield for the second consecutive time. 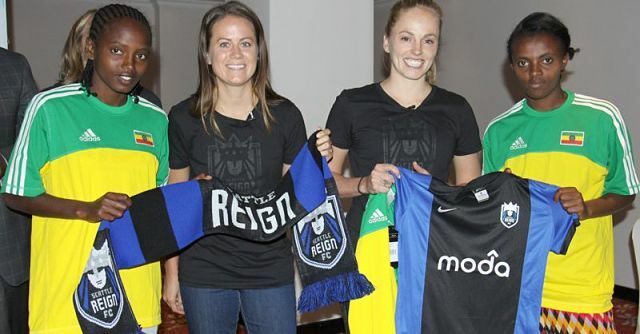 Seattle Reign coach, Laura Harvey was named Coach of the Year for a second consecutive year. The collaboration is supported by the US Embassy’s public diplomacy sports outreach program which has forged links and implemented programs for thousands of young Ethiopian boys and girls in collaboration with the Ethiopian Football Federation and the Ethiopian Basketball Federation. These programs include the semi-annual Community Outreach Youth (COYS) soccer tournament in Dire Dawa for boys and girls based in Oromia, Dire Dawa and Somali and Harari regions and two basketball clinics in Addis organized in conjunction with visiting stars from the National Basketball Association (NBA) and the Women’s National Basketball Association (WNBA). 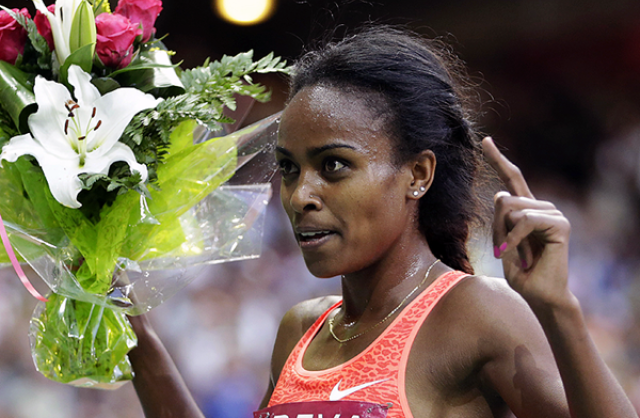 Genzebe Dibaba set a new world record in the indoor mile on Wednesday, beating a record that had stood for 26 years. 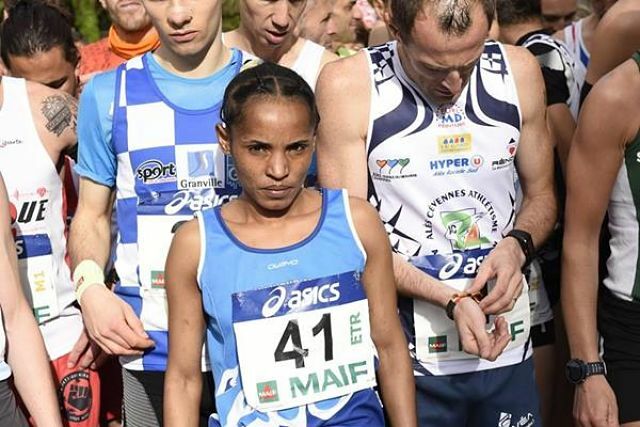 The Ethiopian’s time of 4 minutes, 13.31 seconds beat Doina Melinte’s record set in East Rutherford, New Jersey, in 1990 by nearly four seconds. It was the third consecutive year Dibaba had set an indoor world record in Stockholm, having previously set the 3,000 and 5,000 metre records. On a night of record breaking, Djibouti’s Ayanleh Souleiman also set a new indoor record for the 1,000, streaking away on the final lap of the race to clock 2:14.20. The previous record of 2:14.96 had been set by Denmark’s Wilson Kipketer in 2000. Souleiman’s time still needs to be ratified by the ruling IAAF. 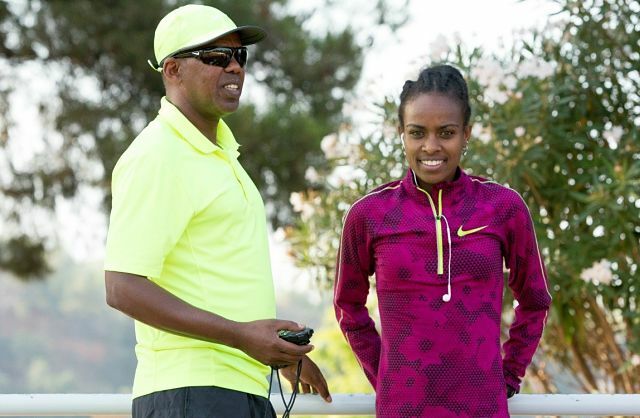 Much has been written about Genzebe Dibaba’s historic season in 2015, but less is known about the man who masterminded the Ethiopian’s journey into the record books, coach Jama Aden. A former elite miler from Somalia, the 53-year-old Aden has been the world’s most successful middle-distance coach in recent years, having coached Dibaba, Taoufik Makhloufi, Ayanleh Souleiman and Abubaker Kaki to championship success.. In a discussion which offers an unprecedented insight into her performances, Aden speaks to Cathal Dennehy about how he transformed Dibaba’s training, why he believes she can run 3:47 for 1500m, and why he thinks doping accusations levelled at her are borne out of jealousy. Through the first half of the men’s and women’s Houston Marathon, it looked like the Ethiopians’ grip on the race could be coming to an end. Gebo Burka and Biruktayit Degefa made sure that didn’t happen. Both came from behind to win on Sunday. 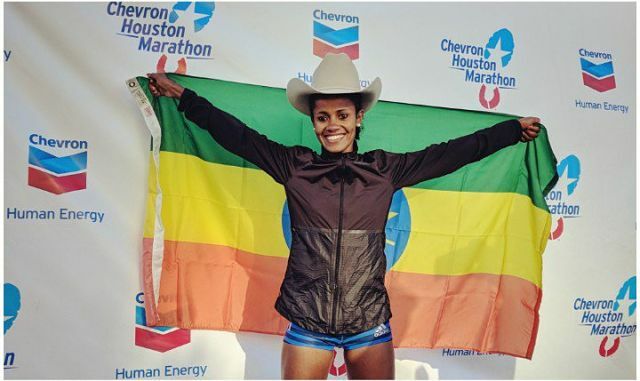 This was the eighth straight year an Ethiopian man won in Houston and the 10th straight year an Ethiopian woman did so. 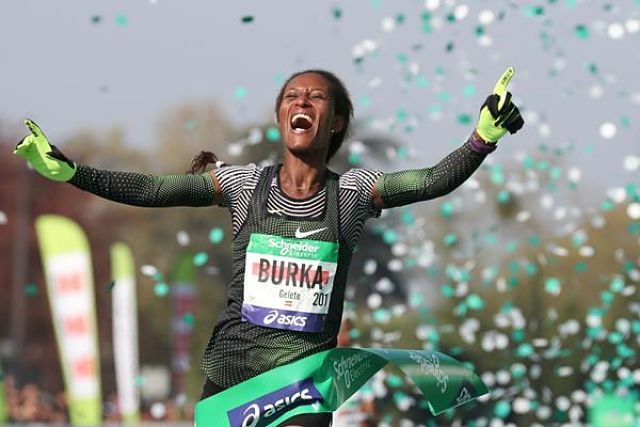 Burka, along with countrymen Girmay Gebru and Yitayal Atanfu, trailed Poland’s Artur Kozlowski by 1 minute, 1 second through 18.6 miles (30 kilometers) but rallied to overtake Kozlowski by 24.8 miles (40 kilometers). 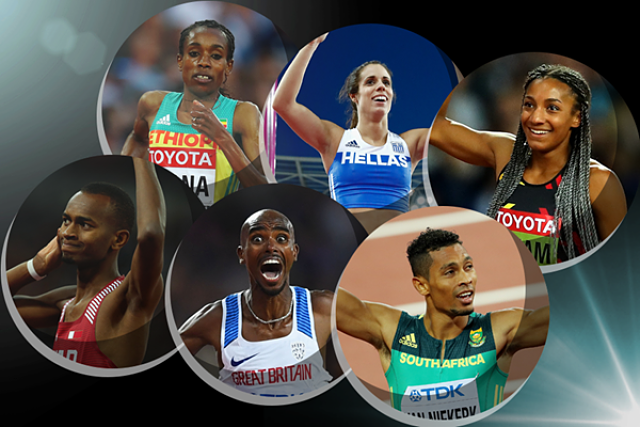 Mo Farah and Genzebe Dibaba have amassed the most votes in the middle/long distance category in the first round of voting for the 2015 IAAF World Athlete of the Year award. Farah successfully defended his 5000m and 10,000m titles at the IAAF World Championships, Beijing 2015. The British runner also clocked a world-leading time of 7:34.66 over 3000m, a world indoor best of 8:03.40 over two miles and a European record of 59:32 in the half marathon. Dibaba won the world 1500m title in Beijing, having broken the world record in the event one month earlier with her time of 3:50.07 in Monaco. She also set a world indoor 5000m record of 14:18.86 and took the bronze medal at that distance at the World Championships. 1. Stanley Biwott, Kenya, 2:10:34. 2. Geoffery Kamworor, Kenya, 2:10:48. 3. Lelisa Desisa, Ethiopia, 2:12:10. 4. Wilson Kipsang, Kenya, 2:12:45. 5. Yemane Tsegay, Ethiopia, 2:13:24. 6. Yuki Kawauchi, Japan, 2:13:29. 7. Meb Keflezighi, United States, 2:13:32. 8. Craig Leon, United States, 2:15:16. 9. Birhanu Dare Kemal, Ethiopia, 2:15:40. 10. Kevin Chelimo, Kenya, 2:15:49. 1. Mary Keitany, Kenya, 2:24:25. 2. Aselefech Mergia, Ethiopia, 2:25:32. 3. Tigist Tufa, Ethiopia, 2:25:50. 4. Sara Moreira, Portugal, 2:25:53. 5. Christelle Daunay, France, 2:26:57. 6. Priscah Jeptoo, Kenya, 2:27:03. 7. Laura Thweatt, United States, 2:28:23. 8. Jelena Prokopcuka, Latvia, 2:28:46. 9. Anna Incerti, Italy, 2:33:13. 10. Caroline Rotich, Kenya, 2:33:19. 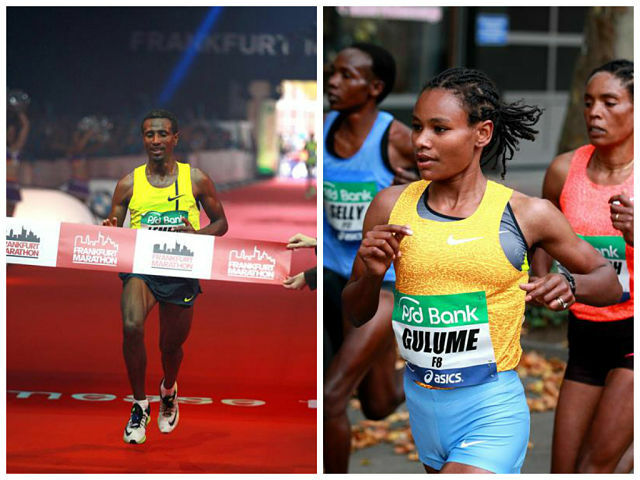 Sisay Lemma and Gulume Tollesa became the first Ethiopian duo to win both the men’s and women’s races at the Frankfurt Marathon when they triumphed at the IAAF Gold Label Road Race on Sunday. In a thrilling finish, three men entered the final kilometre together but Lemma then had enough in reserve to pull away from his Kenyan rivals Lani Rutto and Alfers Lagat and win in 2:06:26, improving his best by 40 seconds. Rutto and Lagat were second and third in PBs of 2:06:34 and 2:06:48 respectively. The finish in the women’s race was even closer as Tollesa beat compatriot Dinkinesh Mekash in a sprint finish to win in a huge PB of 2:23:12. Mekash was given the same time in second place. Runners from around the world will compete November 1, 2015 in the 45th annual New York City Marathon. NEW YORK — More than 50,000 runners will make their way to the starting line in the borough of Staten Island on November 1, for the start of the world’s most famous annual races – the New York City marathon. The race course runs a total of 42.195 km through all five boroughs of New York City, ending up at the finish line in Central Park. A Kenyan man has won the past three marathons and for the past two a Kenyan has finished 1st in the women’s group. But a group of Ethiopians is training hard, hoping to win back the top prize after five years of Kenyan dominance. Many Ethiopian runners train in New York City under the auspices of the West Side Runners Club. A vast majority of the club’s runners are foreign born and this year there is a large Ethiopian contingent. The 2015 TCS Amsterdam Marathon has signed up Ethiopia’s London 2012 Olympic Games marathon champion Tiki Gelana for the IAAF Gold Label Road Race on 18 October. The 27-year-old hasn’t won a marathon since her victory in London three years ago but showed signs that the injury problems of 2013 and 2014 are now behind her when she but clocked 2:24:26 for third place at the Tokyo Marathon in February, her fastest outing since her Olympic triumph. Gelana’s national record of 2:18:58 from the 2012 Rotterdam Marathon makes her the fastest in the women’s elite field and, whether coincidentally or not, has always run well in the Netherlands, setting several personal bests over shorter distances in Dutch road races. She also won the Amsterdam Marathon back in 2011, setting what was then a personal best and course record of 2:22:08, so Gelana has some familiarity with the race itself and knows fast times can emerge if there are favourable weather conditions. Two places behind Gelana in the Japanese capital at the start of this year was Kenya’s 2014 Commonwealth Games winner Filomena Cheyech, and the latter will also be on the start line in Amsterdam. 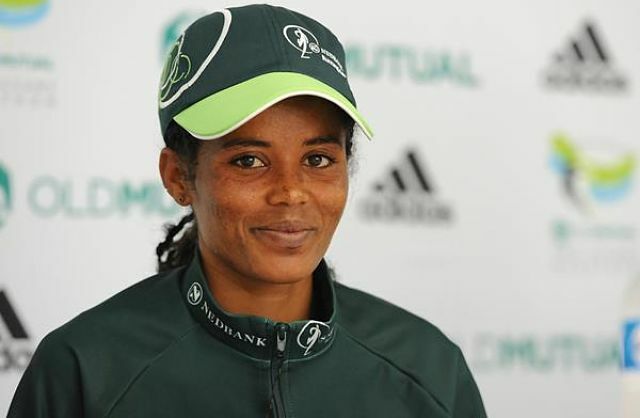 Meseret Mengistu Biru, the winner of the Paris Marathon in April, will head a strong Ethiopian women’s quartet at this year’s Frankfurt Marathon on Sunday 25 October, the organisers of the IAAF Gold Label Road Race announced. 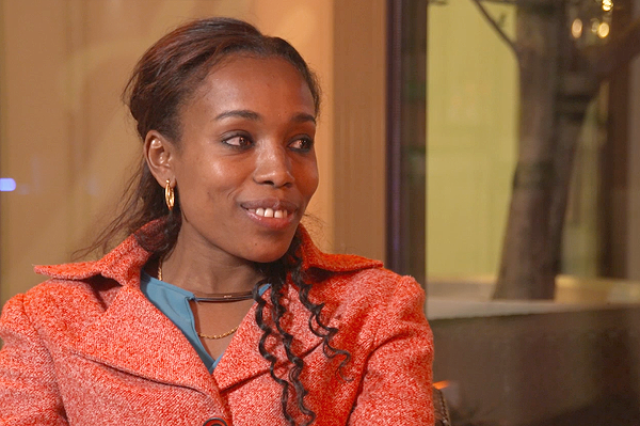 Mengistu will arrive in Frankfurt aiming to continue her winning streak., having won her last three marathons. She won in Cape Town and Soweto last year but the 25-year-old had a breakthrough performance in the French capital, triumphing on the streets of Paris with 2:23:26, an improvement in her personal best of almost six minutes. However, victory far from a foregone conclusion for Mengistu. Among her rivals is Ashete Bekele, who has a very similar personal best. In Dubai at the start of this year, Bekele improved to 2:23:43 yet, such was the quality of the field, it was only good enough for 10th place. Bekele also has the advantage of knowing the course of the Frankfurt Marathon already, having finished third here a year ago in 2:24:59. Another Ethiopian marathon runner on the Frankfurt start line will be Dinkinesh Mekash. Since 2012 she has been admirably consistent, running between 2:25 and 2:30 each year. 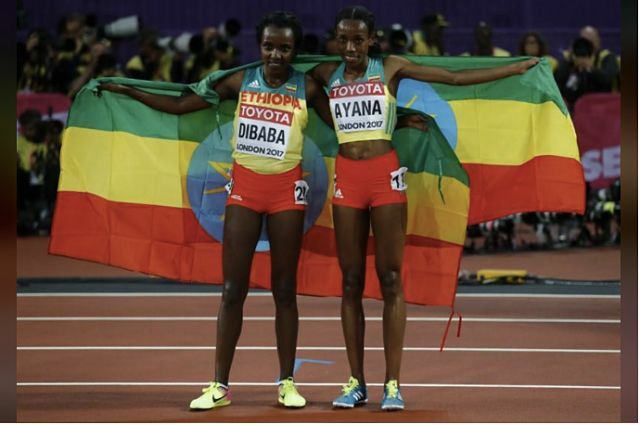 ZURICH, SWITZERLAND — The highly publicised 3000m duel between a trio of gold medallists from the IAAF World Championships, Beijing 2015 was supposed to be one of the highlights of the 2015 IAAF Diamond League final in Zurich and so it proved, with Ethiopia’s Almaz Ayana coming out on top on Thursday. Ayana and her compatriot Genzebe Dibaba, respectively the 5000m and 1500m world champions in Beijing, were helped initially by the Kenyan pacemaker Lydia Wafula, who took the pair through 1000m in 2:49.92, putting them nicely on course for a fast time below 8:30. Poland’s Renata Plis then took over but the two Ethiopians wanted a faster pace than she could deliver and so, with just over three laps to go, Ayana went to the front, towing Dibaba behind her as she passed 2000m in 5:35.36. With two laps to go, the gap between the two Ethiopians and the rest of the field had grown to about 80 metres. Many pundits in the stands were assuming that Dibaba was just biding her time before pouncing on Ayana, but the latter has clearly grown in confidence after her world title and had other ideas. Ayana started to pull away from her great domestic rival with 250 metres to go. Unlike in some other races in the past two years, Dibaba couldn’t respond and it was Ayana who took the honours and crossed the line in 8:22.34, a meeting record and just 0.12 outside her own national record. Dibaba came home second in 8:26.54 but had the consolation of taking the Diamond Race and the US $40,000 winner-takes-all cheque that goes with it. Mare Dibaba won the first women’s marathon title for Ethiopia at the IAAF world track and field championships Sunday, holding off Helah Kiprop of Kenya in a sprint to the finish. Dibaba finished in two hours 27 minutes 35 seconds in Beijing, but needed to pick up the pace after entering the stadium to beat Kiprop, who finished one second behind. Eunice Kirwa of Bahrain earned the bronze. Two-time champion Edna Kiplagat was in contention until the end but faded to fifth place. 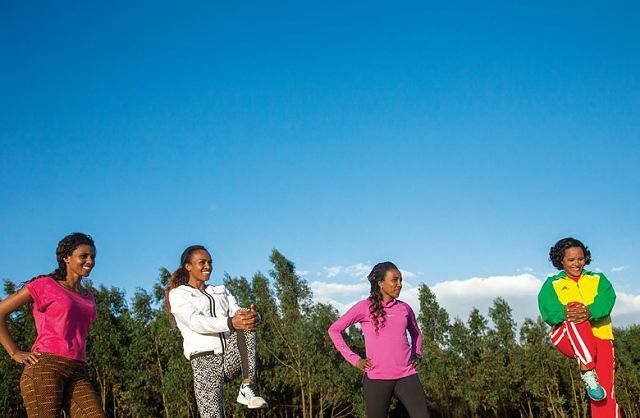 With the stadium in sight, Dibaba kept checking her watch, waiting to make her move. Just after entering the tunnel, she took control and raised her arms after crossing the line. She certainly has a fitting name for a champion. However, she’s not related to Ethiopian long-distance greats Tirunesh and Genzebe Dibaba. 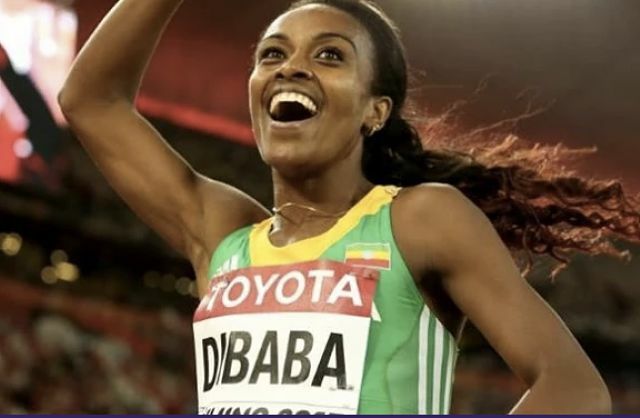 Ethiopian favourite Genzebe Dibaba stormed to the women’s world 1500m title as she stamped her authority with a sumptuous display of controlled running in Beijing on Tuesday. Dibaba last month ran 3:50.07 to shatter the world 1500m record set in 1993 by China’s Yunxia Qu, who competed under the guidance of controversial coach Ma Junren. 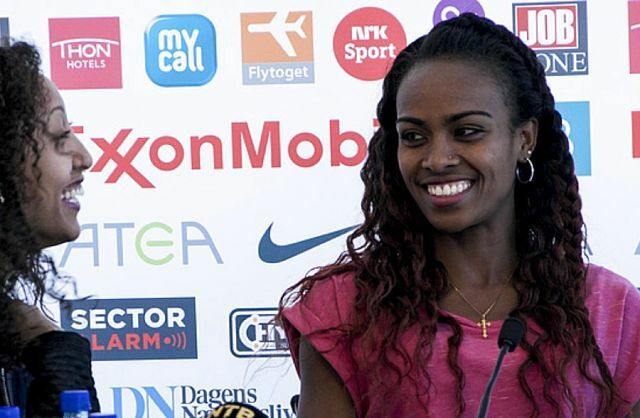 OSLO, NORWAY — Genzebe Dibaba’s bid to take her elder sister’s 5,000-meter world record at the Bislett Games ended in disappointment when she finished more than 10 seconds off the mark on Thursday. Having declared her intention to beat older sister Tirunesh’s record of 14 minutes, 11.15 seconds, set in the same stadium in 2008, Dibaba won in 14:21.29, ahead of Ethiopian compatriot Senbere Teferi, and Kenya’s Viola Jelagat Kibiwot. “I tried hard but the pacemakers could not do what I needed. Of course, cold and wind also played a role, but overall I’m OK with the race. I did my best,” Dibaba said. FIFA said it has suspended the bidding process for the 2026 World Cup because of the ongoing corruption scandal involving the world football governing body. 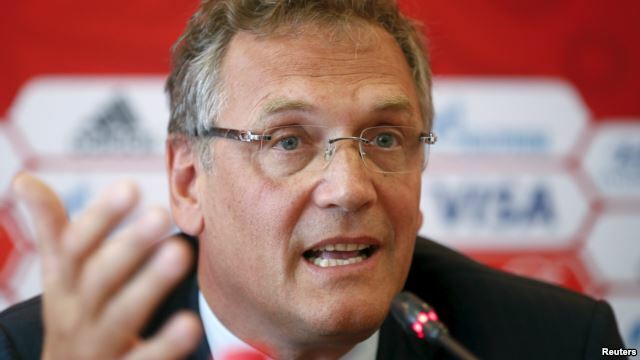 It would be “nonsense to start any bidding process for the time being,” FIFA Secretary General Jerome Valcke said at a news conference in Russia on Wednesday. The host of the 2026 world football championship was set to be chosen by FIFA members during a 2017 meeting in Malaysia. It is not clear when the decision now will be made. The United States, Canada, Mexico, and European countries are thought to be among the likely bidders for the tournament. A U.S. indictment issued last month charges nine FIFA officials and five corporate executives with offenses that include racketeering, wire fraud and money laundering. Swiss officials are investigating separate allegations of mismanagement and money laundering connected to the awarding of the 2018 and 2022 World Cups to Russia and Qatar respectively. “Were there to be proof the state of Qatar was involved in subverting the process, then [Qatar] would have pretty limited legs to stand on in a legal context, because it would have gained the tournament illicitly,” Martin Lipton, deputy head of sport content at London’s The Sun, said. If there’s going to be a change of venue for 2022, “then the needs of rotation mean that you have to change the list of potential bidders for 2026.” This requirement, he said, makes FIFA’s decision to hiatus the 2026 bidding process a prudent one. Although he has not been formally charged with any crimes, FIFA President Sepp Blatter became caught up in the scandal and announced he would resign once a new president is elected sometime between December 2015 and March 2016. U.S. court records unsealed last Wednesday show that a former executive committee member of FIFA admitted accepting bribes in connection with the 1998 and 2010 World Cups. Charles Blazer, a U.S. citizen who spent two decades as one of the world’s most powerful soccer officials, secretly pleaded guilty in November 2013 to 10 criminal counts in New York as part of an agreement with U.S. prosecutors, according to the partially redacted transcript of the hearing. 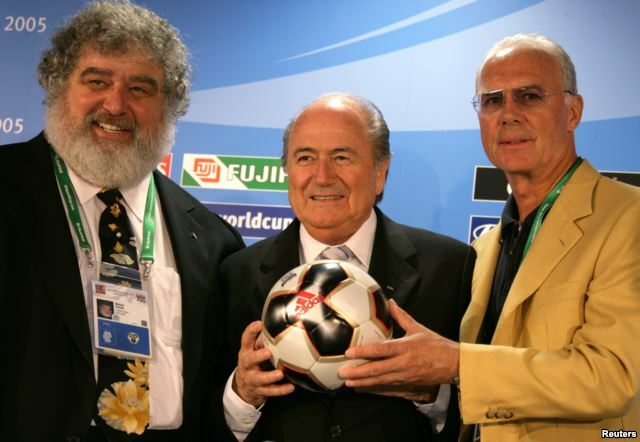 Blazer told a U.S. judge that he and others on FIFA’s executive committee accepted bribes in connection with the choice of France as the host of the 1998 World Cup. He said he also accepted bribes linked to the 2010 event awarded to South Africa. 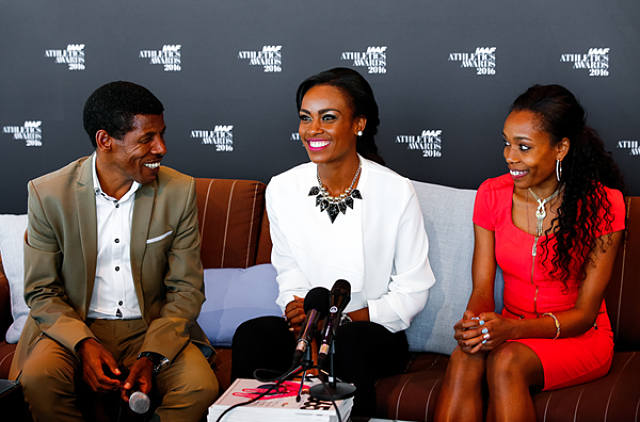 Genzebe Dibaba (r) will compete in the 5,000m race at the 2015 ExxonMobil Bislett Games in Oslo, Norway. In a special tribute to the 50th anniversary of the ExxonMobil Bislett Games, Ethiopia’s world indoor 3,000m champion, Genzebe Dibaba has officially revealed to the media her intent to break the world 5,000m record on Thursday. The 24-year-old star explained the importance of continuing her family’s fine record-breaking tradition in Oslo, with the task of eclipsing the 14:11.15 global twelve and a half lap mark – held by her elder sibling, Tirunesh Dibaba from her 2008 victory in the Norwegian capital – as the main goal. “I’ve spoken to my sister and she told me to use the unique atmosphere in the great stadium. “My cousin, Meseret Defar (the 31-year-old double Olympic and world 5,000m champion) also broke the world record here (with 14:16.63) in 2007. She also won here in 2009 and 2013. “It feels more safe to run indoors – this is my first time attacking the 5,000m outdoor world record so I am a bit nervous but I am confident it will go well,” she revealed. A BBC investigation has seen evidence that details what happened to the $10m sent from Fifa to accounts controlled by former vice-president Jack Warner. But documents suggest Mr Warner used the payment for cash withdrawals, personal loans and to launder money. The 72-year-old, who has been indicted by the US FBI for corruption, denies all claims of wrongdoing. Fifa says it is co-operating with the investigation. And South Africa’s Football Association has issued a detailed statement denying any wrongdoing. The papers seen by the BBC detail three wire transfers by Fifa. In the three transactions – on 4 January, 1 February and 10 March 2008 – funds totalling $10m (£6.5m) from Fifa accounts were received into Concacaf accounts controlled by Jack Warner. 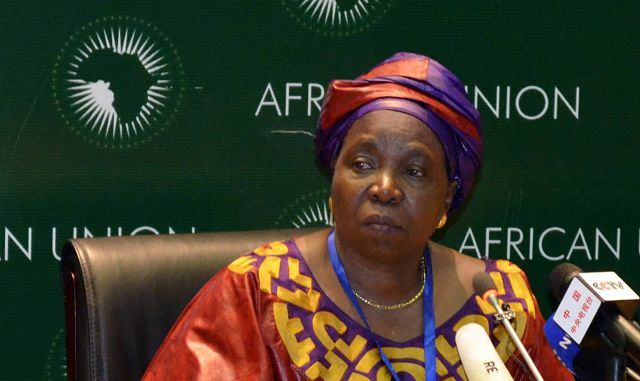 A letter implicates the SA World Cup boss and Nkosazana Dlamini-Zuma in the $10-million payment now alleged to be a bribe. South African 2010 World Cup boss Danny Jordaan asked Fifa to pay the $10-million that United States prosecutors allege was a bribe after he had “a discussion” with Nkosazana Dlamini-Zuma, now the African Union chairperson. Jordaan, a former anti-apartheid activist who re-entered politics as the Nelson Mandela Bay mayor last week, put the request to Fifa secretary general Jérôme Valcke in a December 2007 letter, which names Dlamini-Zuma and Jabu Moleketi, respectively foreign affairs minister and deputy finance minister under former president Thabo Mbeki. This supports the allegation, first contained in the US indictment of football officials internationally and unsealed last week, that the “government of South Africa” had agreed to a bribe, disguised as a football development contribution, for Caribbean football boss Jack Warner and two others. 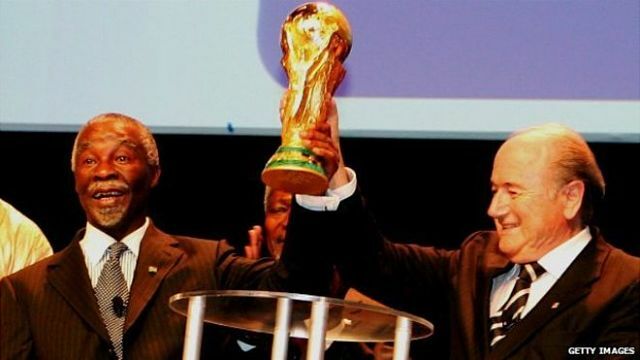 The payment was allegedly to secure their support in the Fifa executive committee vote that won South Africa the right to host the 2010 World Cup. Sports Minister Fikile Mbalula, speaking for the government, has insisted that the $10-million payment was intended as a bona fide contribution to football development in the Caribbean. But it is understood from a senior government source that members of President Jacob Zuma’s Cabinet are privately not convinced of this. The allegations about South Africa have become the sharp end of the worldwide scandal unleashed by the US indictment, which describes “corruption that is rampant, systemic and deep-rooted” in football. 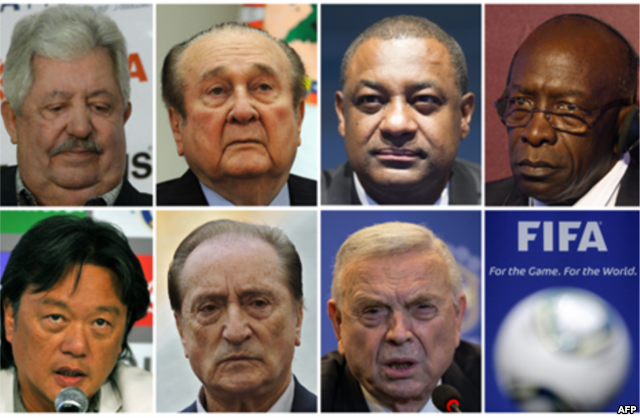 Among those in the firing line are Valcke, whom the New York Times has outed as the unnamed Fifa official allegedly central to the $10-million payment. The races within the race were the stories behind the Ottawa Marathon on Sunday. 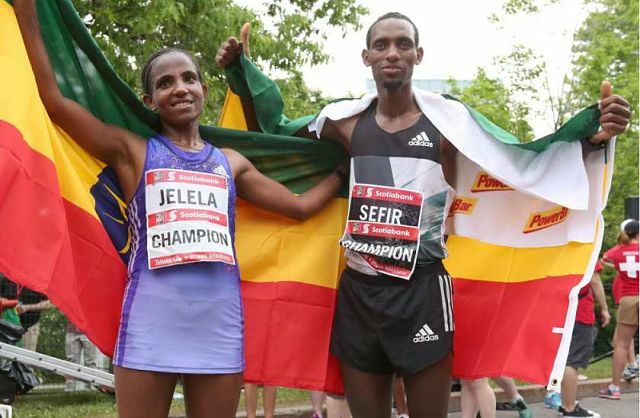 To begin with, there was a third consecutive Ethiopian sweep of the men’s and women’s titles in the 42.195-kilometre race, with Girmay Birhanu and Aberu Zennebe claiming the $30,000 U.S. top prizes from Tamarack Ottawa Race Weekend organizers. Neither approached record times, but it wasn’t for lack of trying. The elite competitors in both divisions pushed the pace well into the race, but paid for it near the end, particularly as they battled a steady headwind in the final kilometres along Sussex Drive, Colonel By Drive and the Queen Elizabeth Driveway. 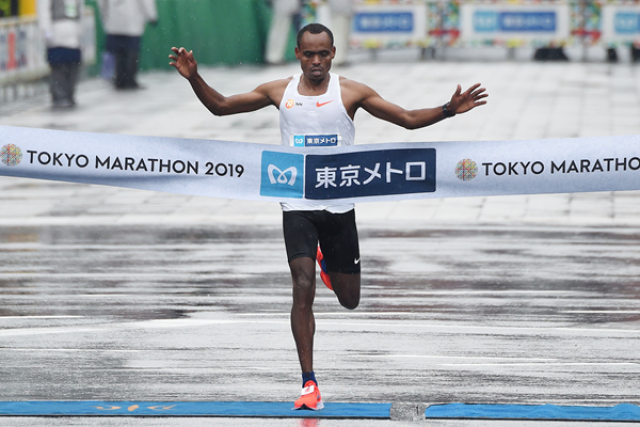 “I’m very happy with the result, but I was hoping for 2:06 or 2:07,” said Birhanu, who actually crossed the finish line in two hours eight minutes 14 seconds, more than 40 seconds ahead of Kenya’s Philip Kangogo and another Ethiopian, Chele Dechasa, but 80 seconds off the 2014 record established by Yemane Tsegay. The lead pack of 15 male runners dropped to a dozen between six and 15 kilometres, and it was down to nine when they reached the 23K mark in just under 69 minutes. Birhanu, three Kenyans and one of the paid pacesetters surged ahead at that point, but there was still a group of four approaching 32K. Then Birhanu pushed the pace again. Trying to repeat his April victory in a marathon in South Korea, the 28-year-old was leading by about 13 seconds as he left New Edinburgh and turned back onto Sussex Drive, and he ran the rest of the way alone. 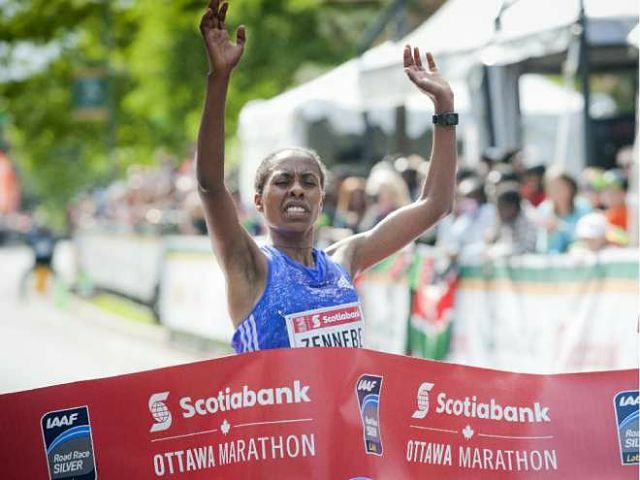 Zennebe’s victory was actually the sixth in a row in the Ottawa Marathon for Ethiopian women, following Merina Mohammed (2010), Kebebush Haile Lema (2011), Yeshi Esayias (2012-13) and Tigist Tufa, whose 2:24:30 was exactly a minute faster than the time Zennebe produced on Sunday. 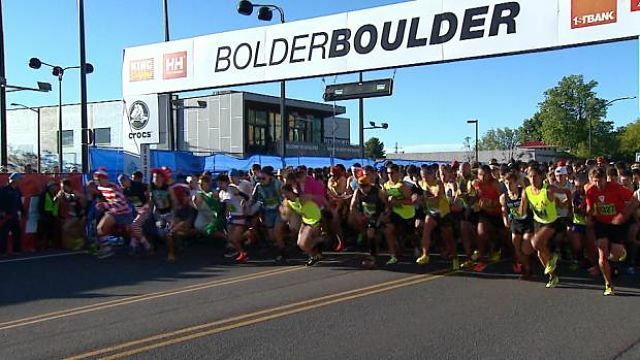 Runners from Ethiopia won the Bolder Boulder professional 10K race on Monday while two Colorado residents were the top man and woman in the citizens’ race. Belete Assefa finished more than 16 seconds ahead of Solomon Deksisa, also of Ethiopia, with a time of 29:04 to win his second Bolder Boulder. Meskerem Assefa was the first professional woman to cross the finish line in a packed Folsom Field at the University of Colorado. FIFA has cleared Arsenal midfielder Gedion Zelalem to feature for the United States and play in the upcoming Under-20 World Cup. U.S. Soccer announced the decision on Wednesday afternoon and ended the protracted saga about Zelalem’s international fate in the process. 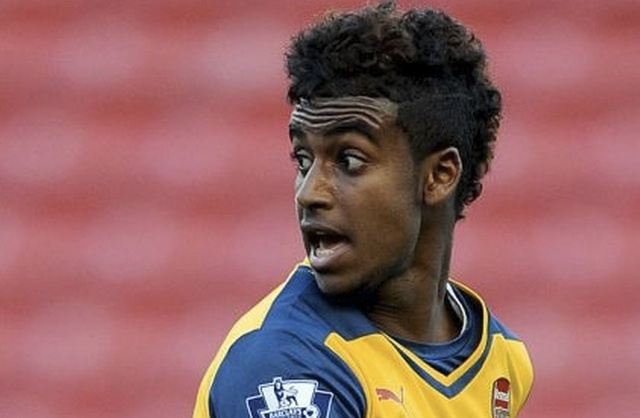 Zelalem needed to receive approval from FIFA to turn out for the U.S. after receiving his citizenship in December. He did not fulfill the immediate requirements of living five years in his adopted country prior to turning 18, but U.S. Soccer appealed his case to FIFA and successfully argued that Zelalem — also eligible to feature for Germany (his birthplace) and Ethiopia (his father’s native country) — should receive clearance based upon the specific circumstances in his case. The decision paves the way for Zelalem to assume his place in the under-20 squad for the upcoming World Cup and subsequently state his claims for inclusion with the senior team in the future.